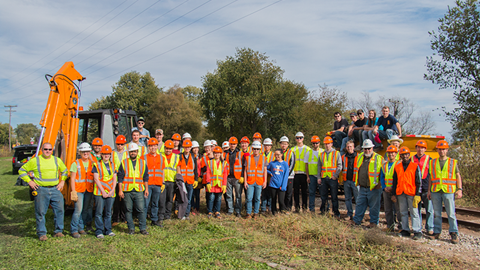 Group photo from October 20, 2018. 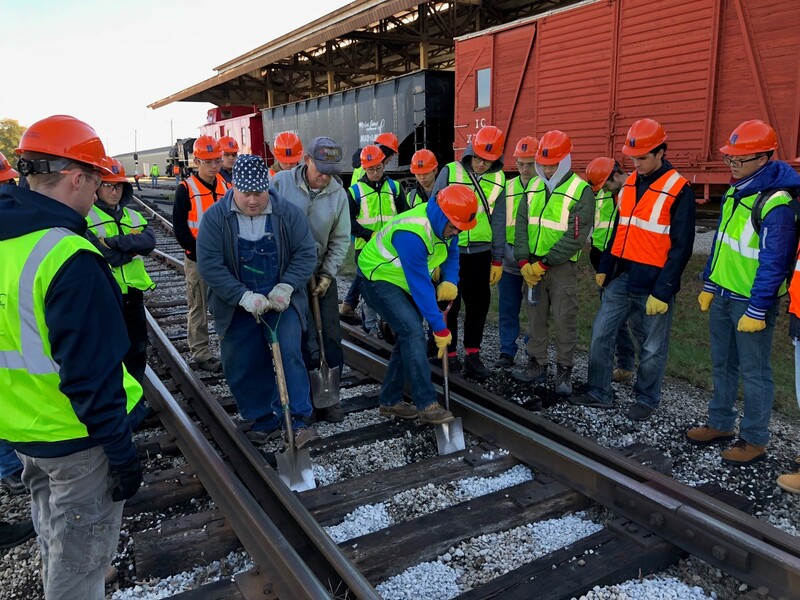 Approximately 50 civil engineering students and faculty from the CEE 408 and 409 classes participated in two work days at the Monticello Railway Museum (MRM) in Monticello, Illinois. 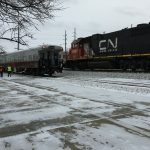 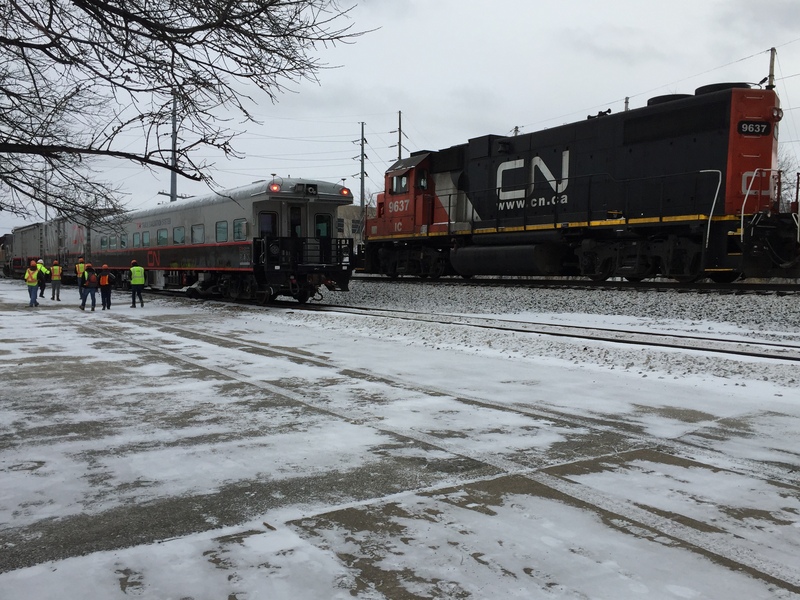 AREMA Student Chapter members braved the cold on Saturday, December 19, 2017 to tour CN’s Geometry Car as it passed through Champaign, IL. 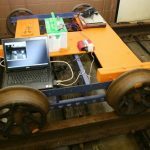 Nao Nishio points out the various sensors and measuring systems on the outside of the geometrycar and how they relay information to the software in the inside. 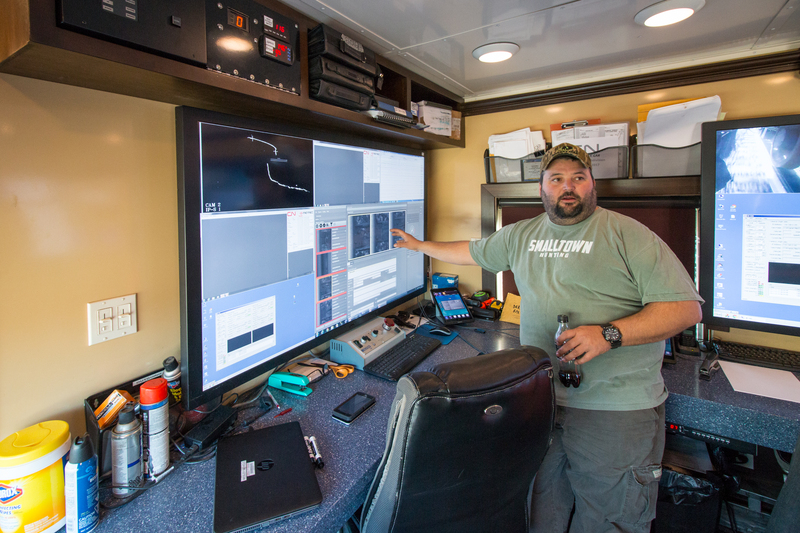 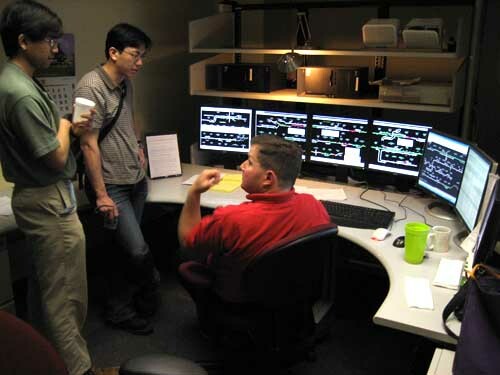 A CN employee points out how the data management system is displayed on the large screens inside the geometry car. 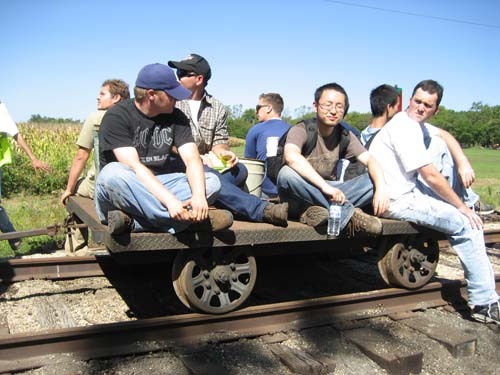 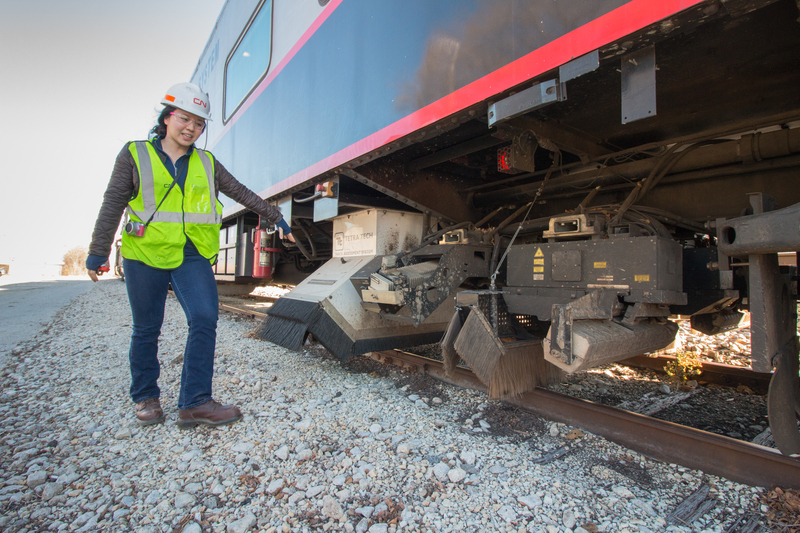 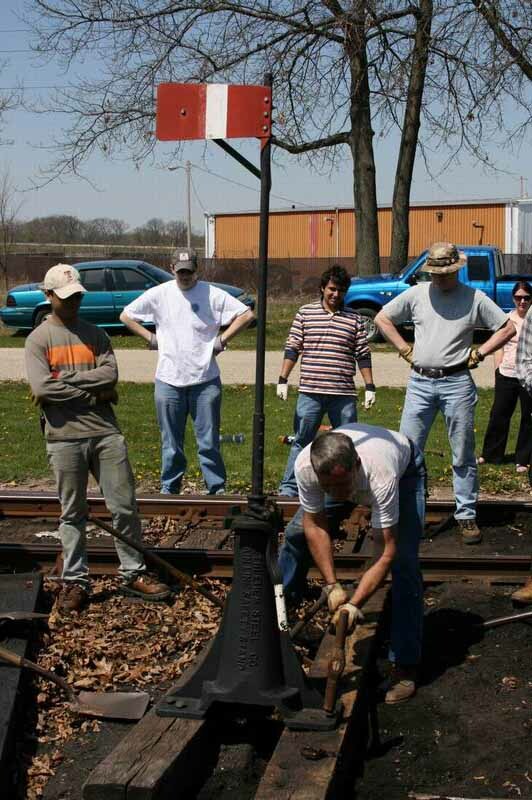 A CN employee demonstrates to students how the geometry car inspects several parameters of the track without obstructing normal railroad operations. 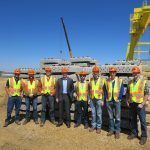 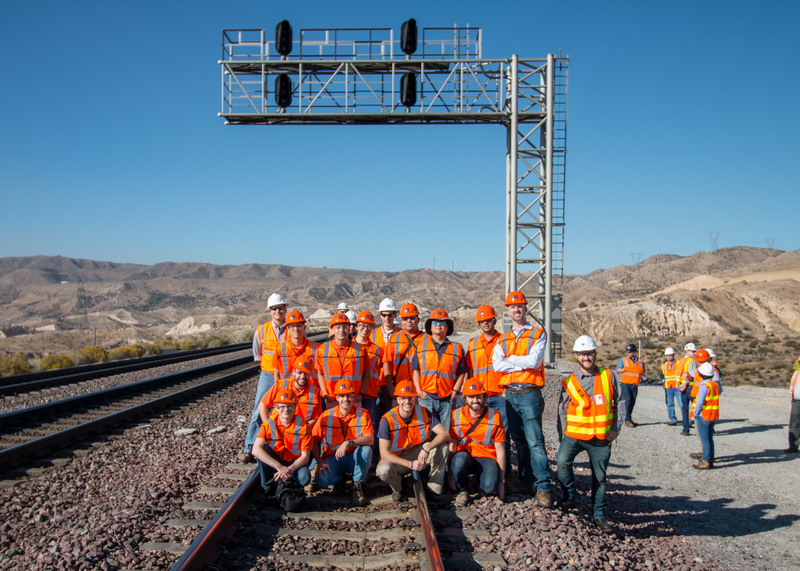 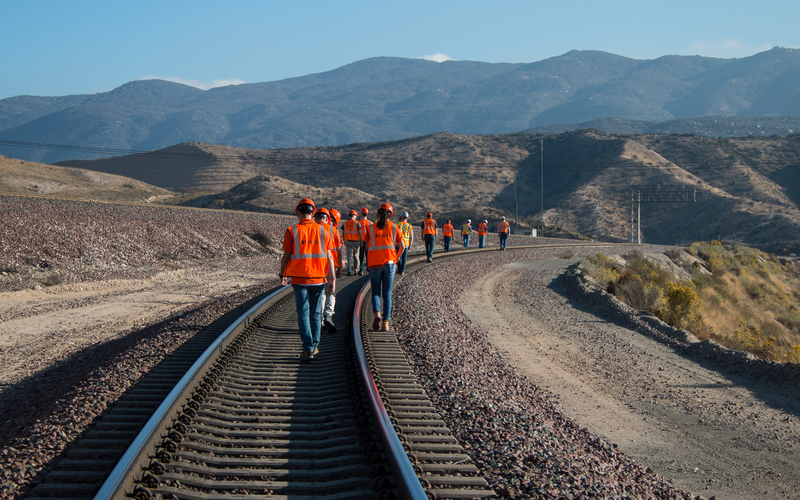 The RailTEC Infrastructure Group participated in the AREMA Committee 30(TIES) technical tour of Cajon Pass on November 1, 2017. 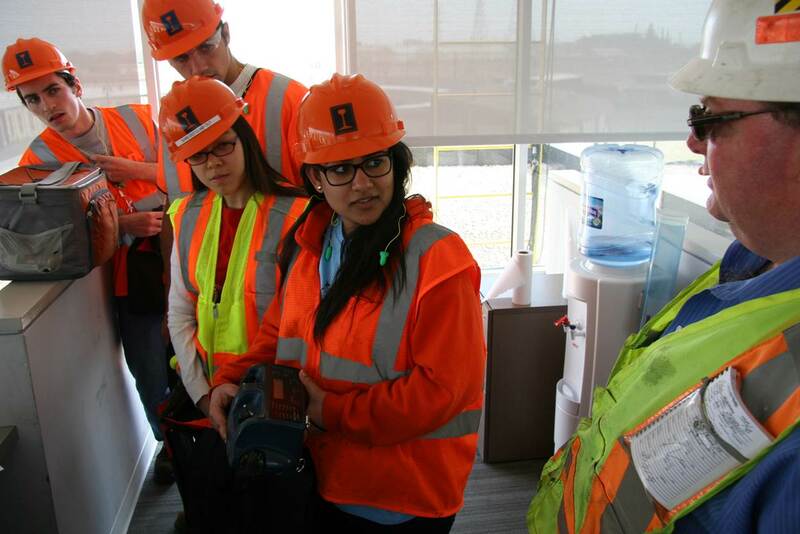 RailTEC students at Mission Tower on their technical tour of LA Metrolink on Tuesday, October 31, 2017. 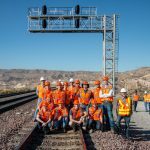 Cajon Pass is a mountain pass between the San Bernardino Mountains and the San Gabriel Mountains in Southern California in the United States. 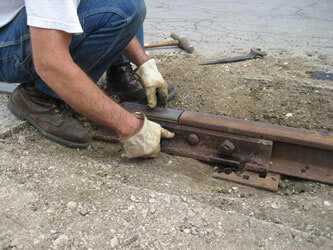 It was created by the movements of the San Andreas Fault. 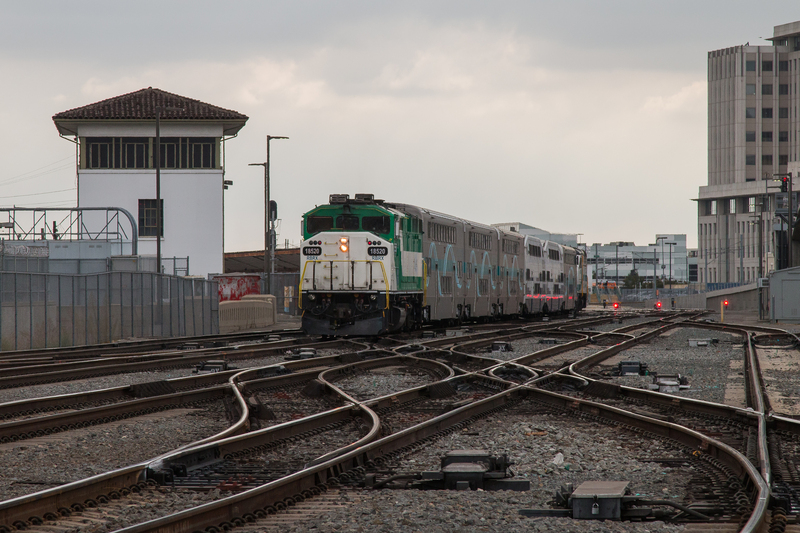 Metrolink trainsoperate on seven routes across a six-county, 538 route-mile network, which includes a portion of northern San Diego County. 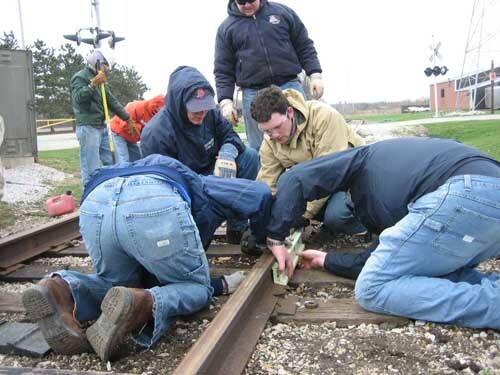 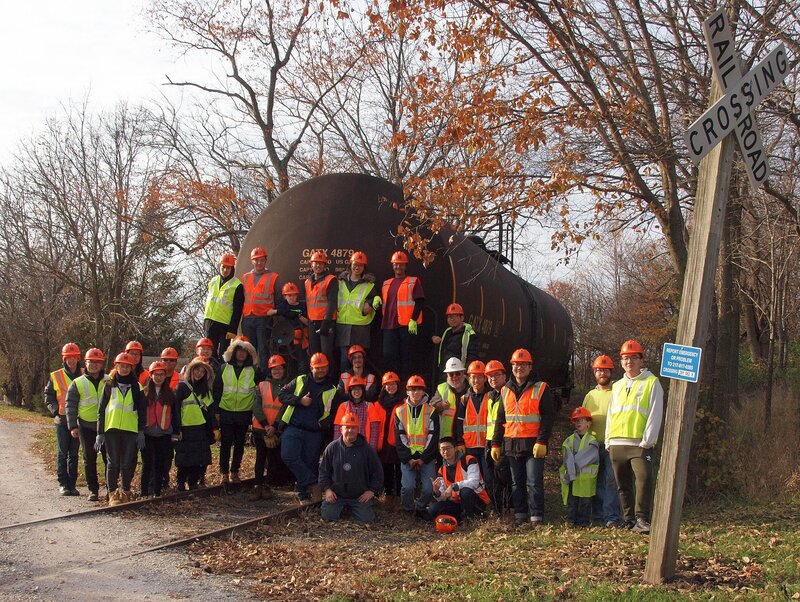 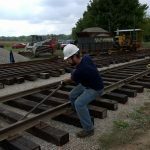 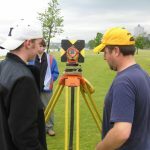 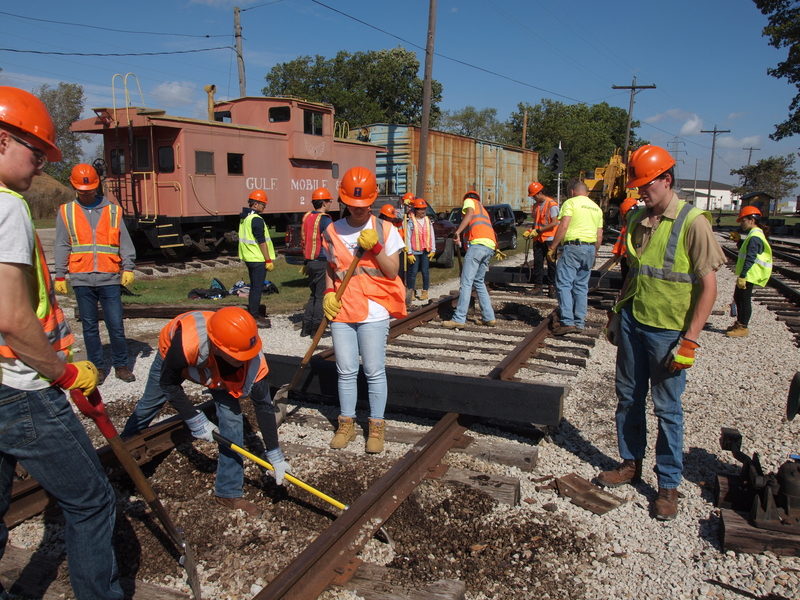 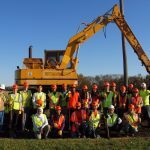 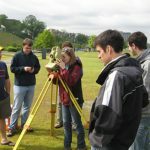 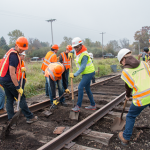 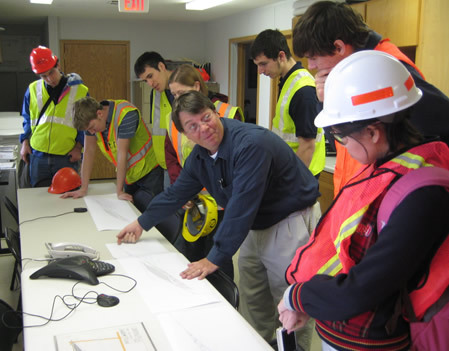 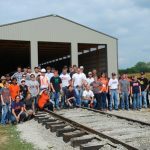 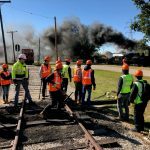 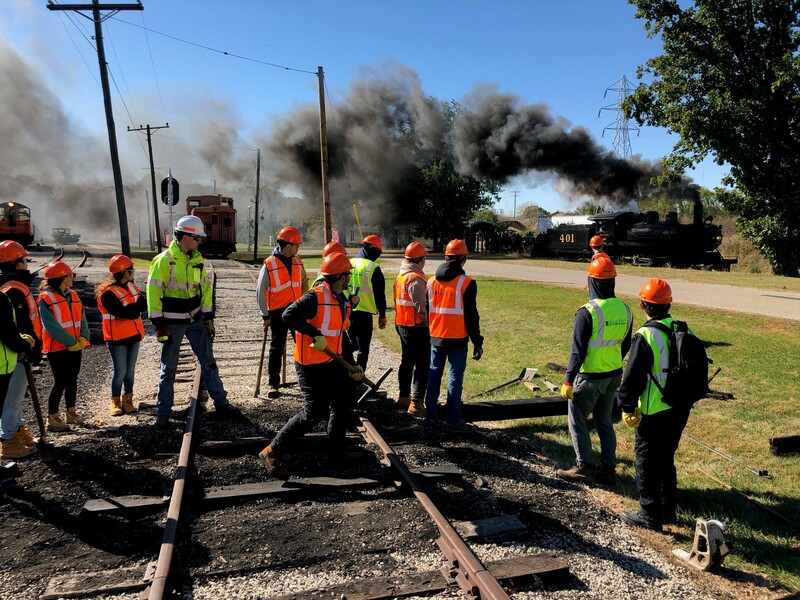 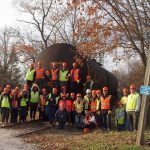 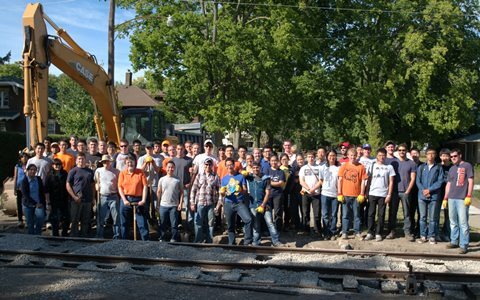 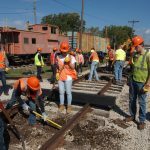 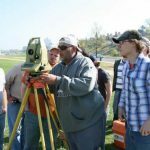 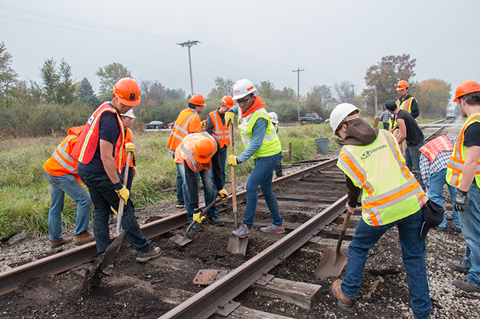 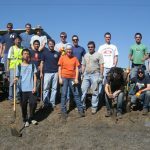 Approximately 50 civil engineering students and faculty from the CEE 408 and 409 classes participated in two “work days” at the Monticello Railway Museum (MRM) in Monticello, Illinois. 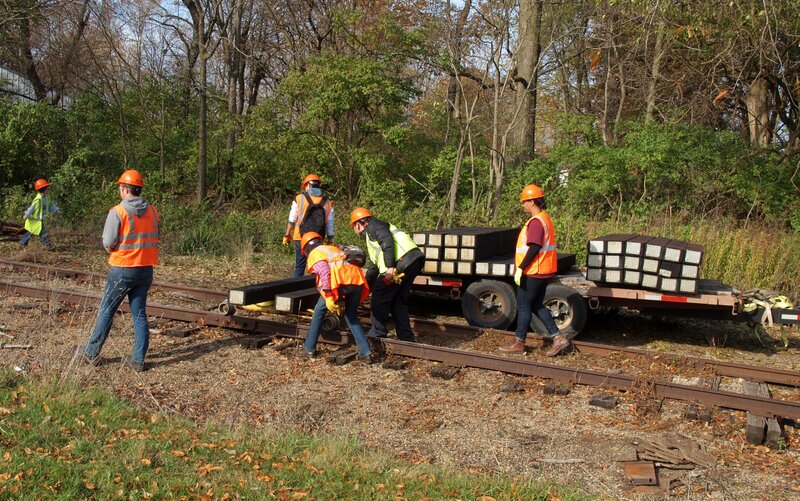 Students gaining hands on track work experience. 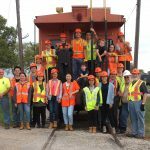 Thanks to MRM for the opportunity to provide a working field trip experience for RailTEC students. 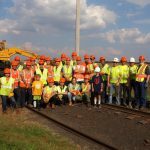 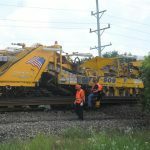 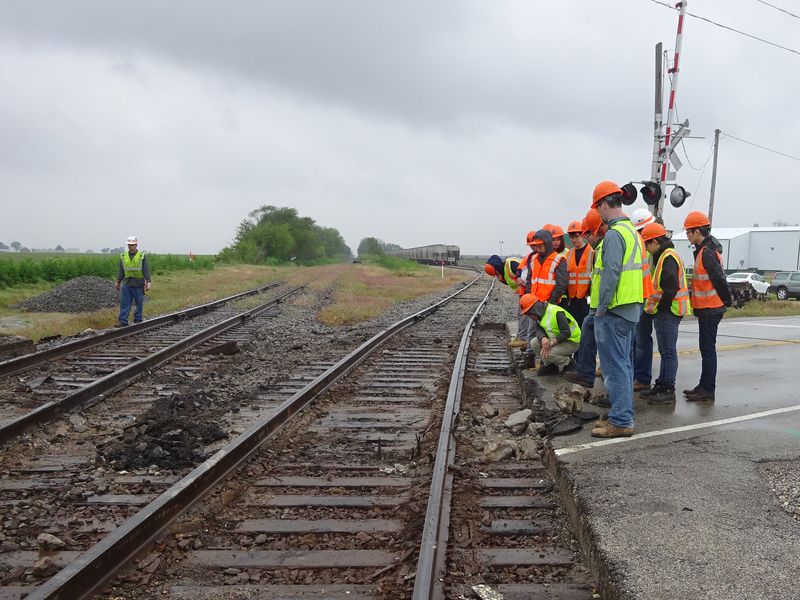 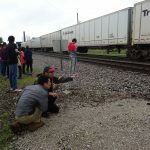 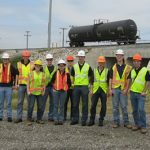 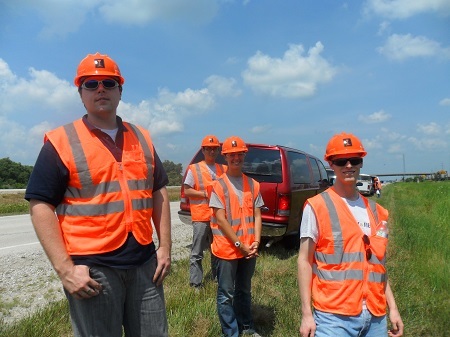 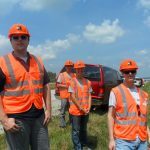 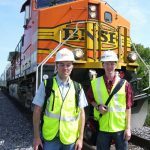 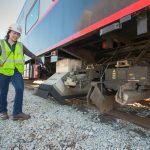 On May 24, 2017 a group of 10 RailTEC students and faculty went to an Norfolk Southern (NS) job site to inspect crosstie issues at a local rail crossing. 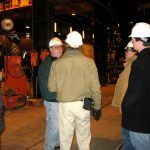 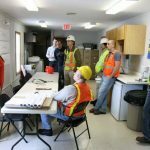 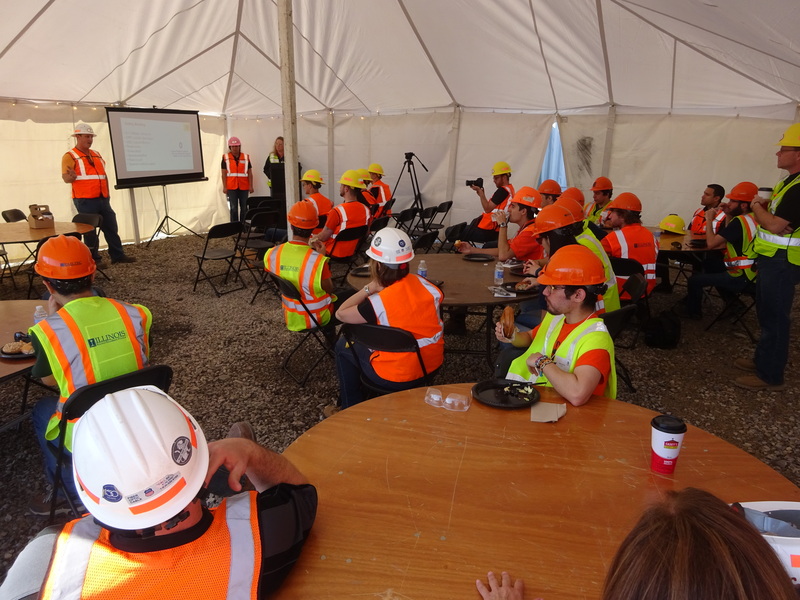 The group received a safety briefing with NS and watched construction activities for about an hour before returning to campus. 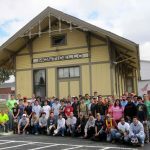 Twenty five faculty and students from RailTEC classes on a working field trip to the Monticello Railroad Museum (MRM) on September 24, 2016. 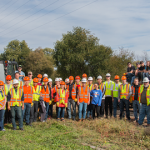 Group photo on October 22, 2016 of faculty and students from RailTEC classes on the second day of a working field trip to the MRM. 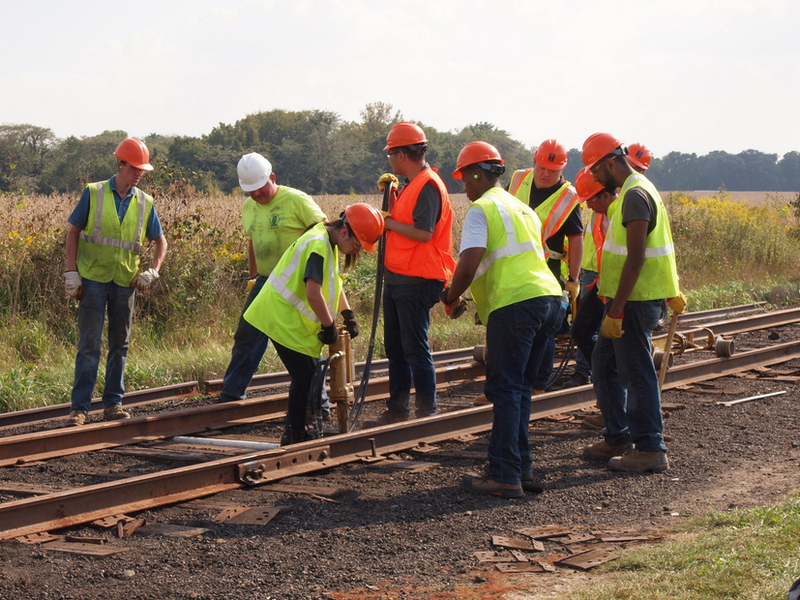 Students gaining hands on track work experience. 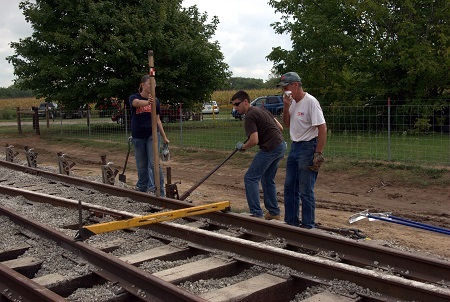 Thanks to the Monticello Railway Museum for the opportunity for the students to practice their skills. 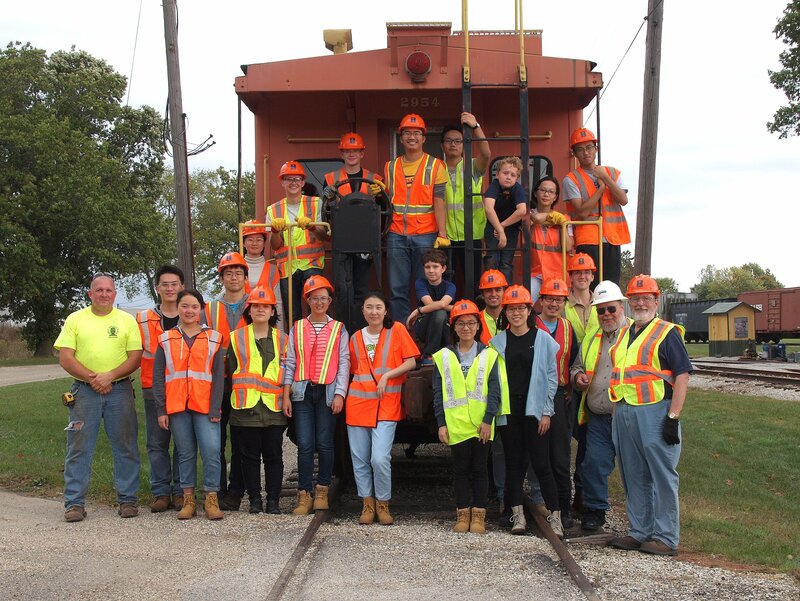 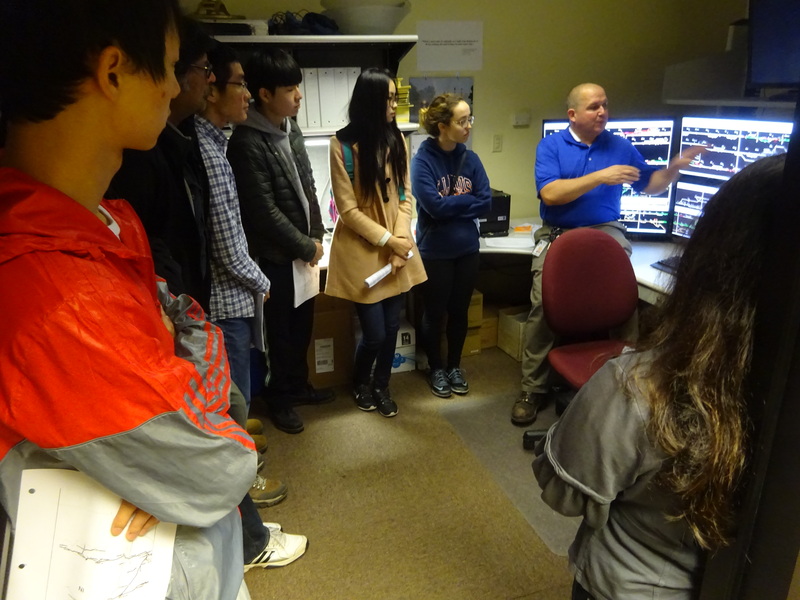 On Saturday, April 30 the CEE410 class (Railway Signaling and Control) visited the Norfolk Southern RR Illinois Division HQ and train dispatching center. 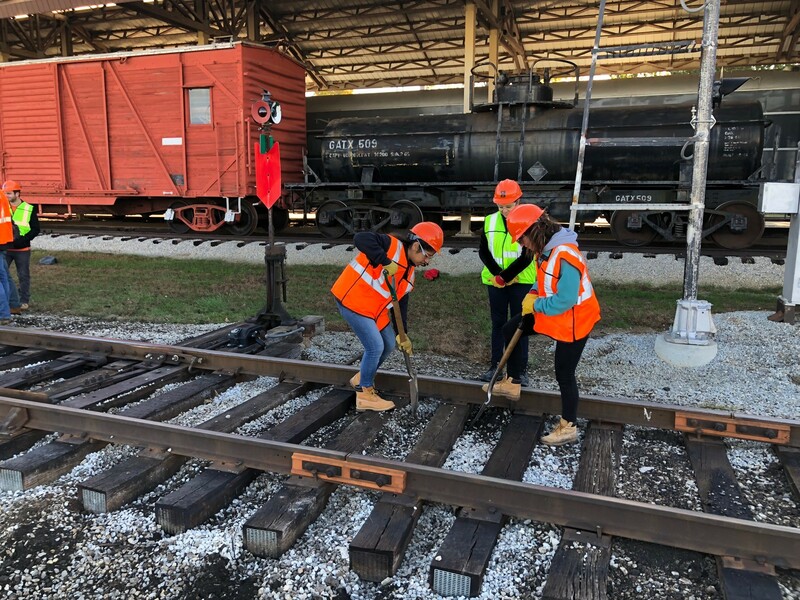 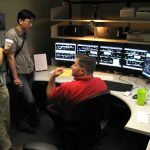 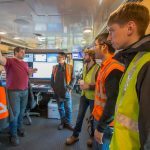 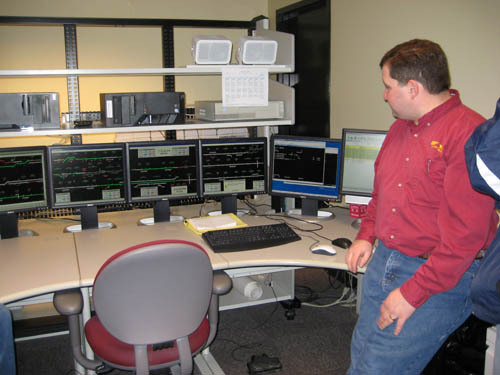 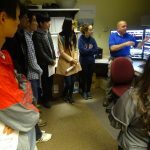 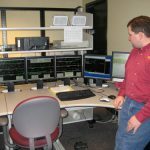 Students had the opportunity to meet train dispatchers and observe the dispatching hardware and software Norfolk Southern uses to control train movements safely and efficiently through much of the Midwest. 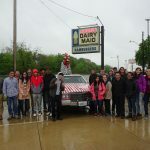 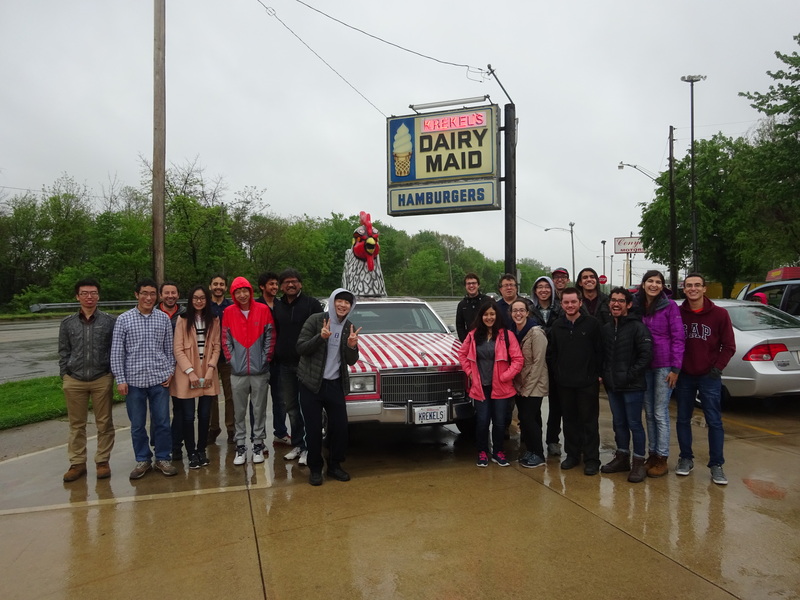 The group of 20 students enjoyed lunch at Krekel’s Dairy Maid in Decatur before heading back. 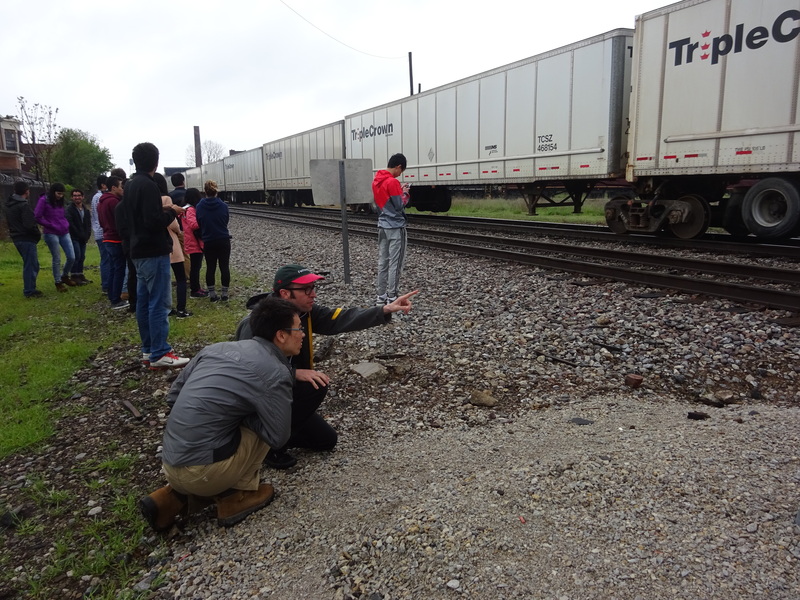 Students also witnessed various rail and train interactions. 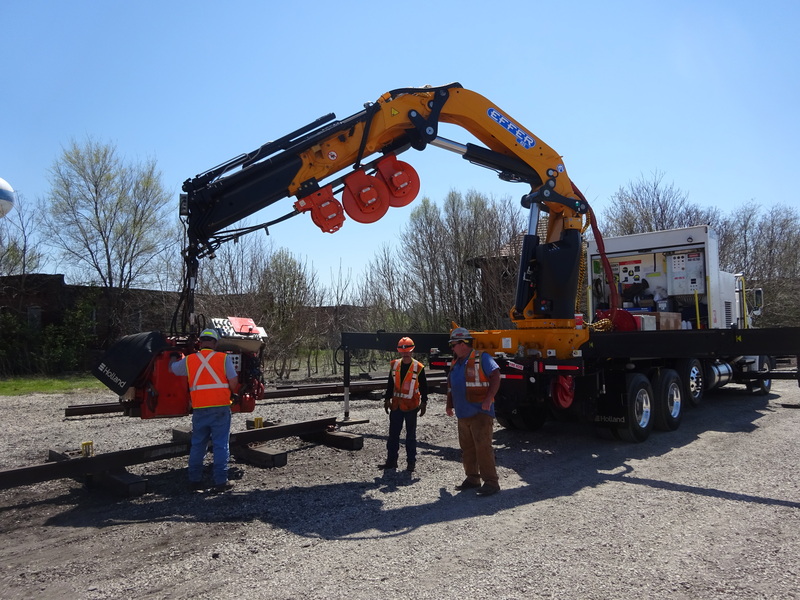 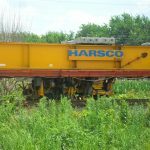 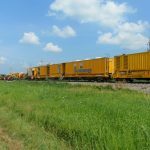 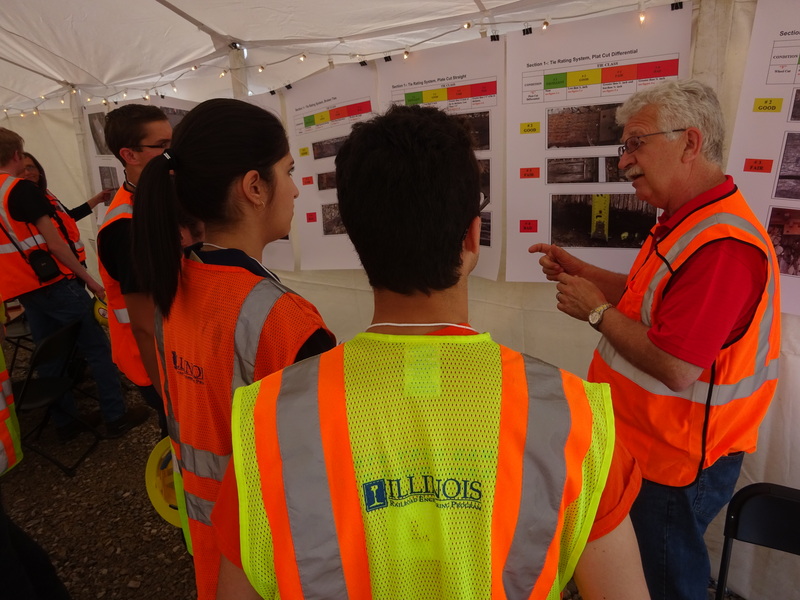 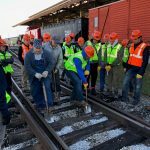 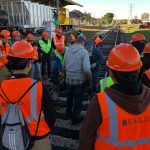 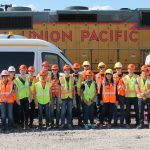 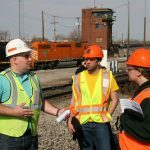 Union Pacific Railroad hosted a railroad engineering field day on Saturday, April 16, 2016 at the UP Railyard in Villa Grove, IL. 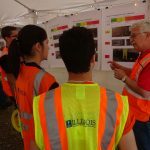 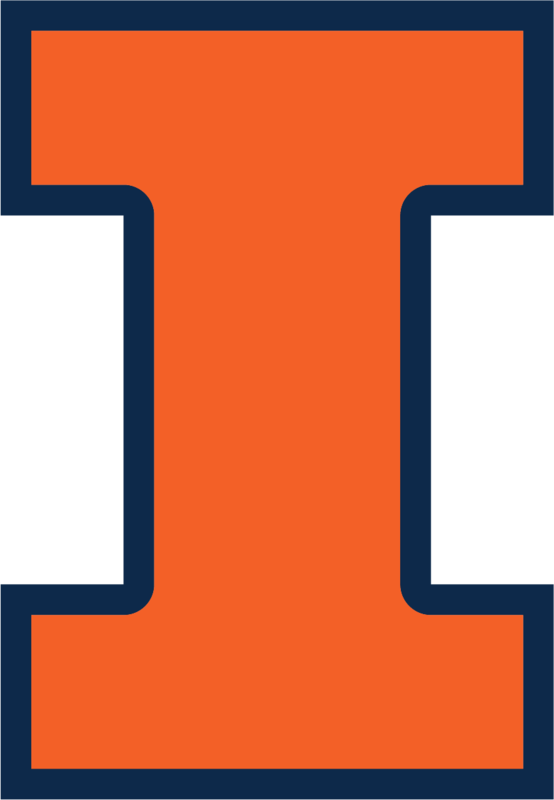 Students from UIUC and Purdue attended. 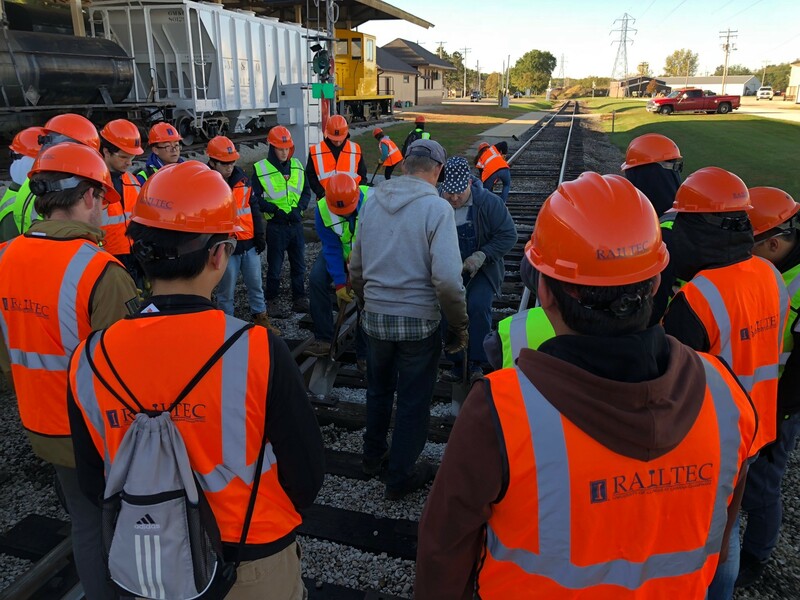 RailTEC students learned about career opportunities in railway engineering and met the people and machines that keep the rail network running. 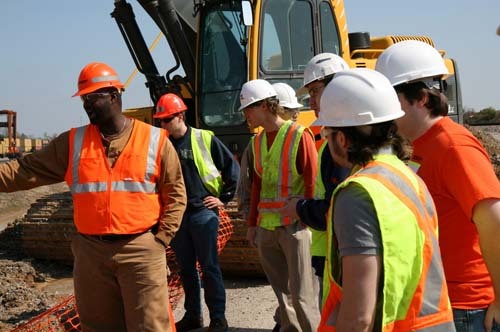 Ken Sito, Senior Assistant Vice President of Maintenance & Renewal in UP’s Engineering Department, interacts with students. 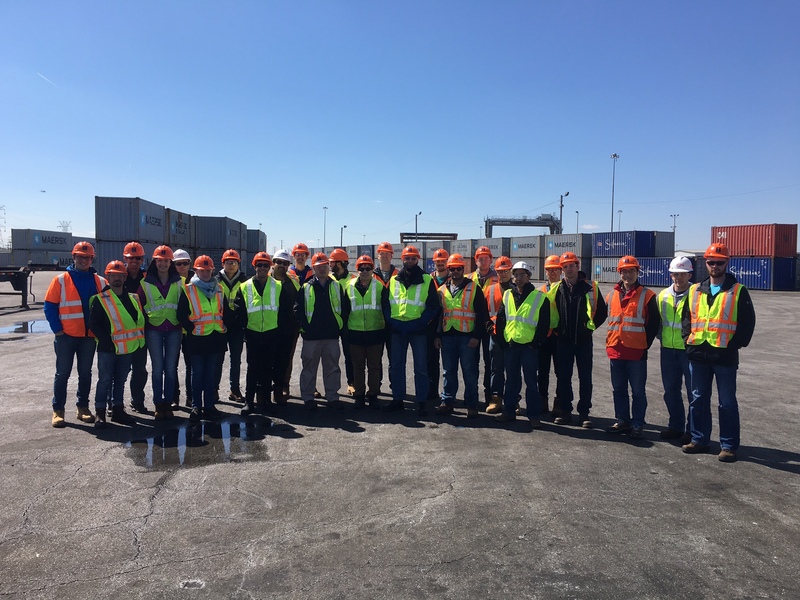 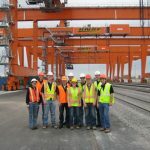 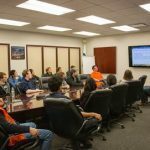 On Saturday 9 April, University of Illinois at Urbana-Champaign’s CEE 411 class (titled Railroad Project Planning and Design) traveled to Chicago to visit CSX’s Bedford Park facility. 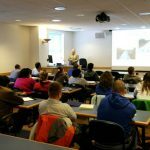 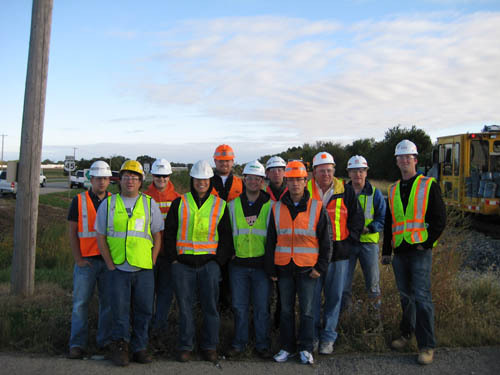 This class focuses on the planning, design, and construction management of large capital projects. 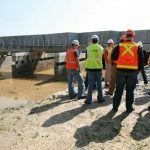 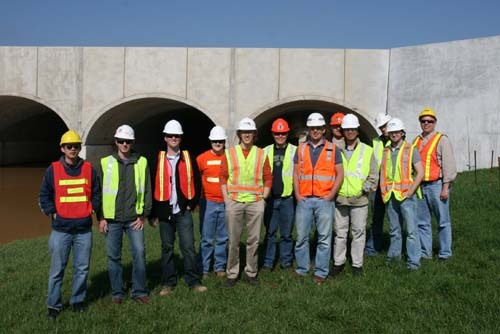 As a part of the field visit they toured Bedford Park to see what a large capital project looks like once it is constructed and operational. 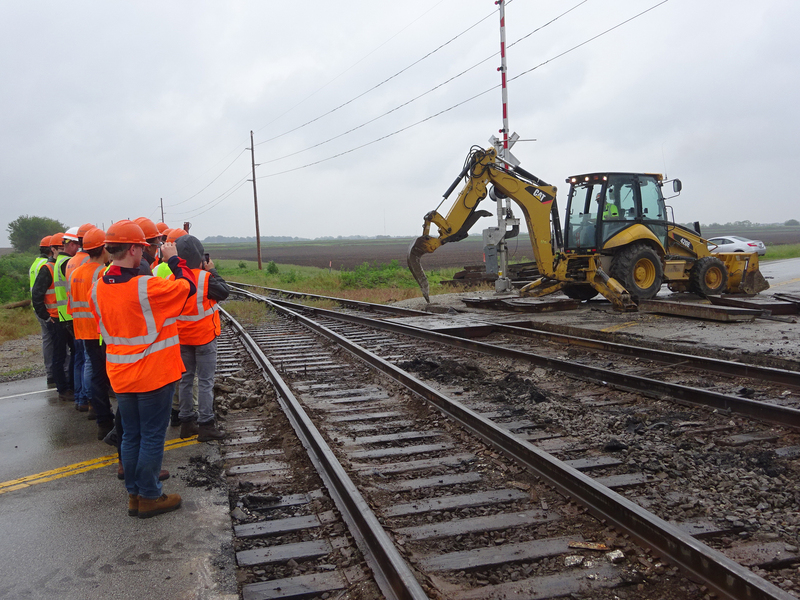 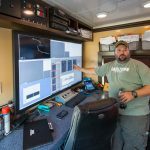 This provided a firsthand close up loop at an operational project and allowed the students to ask questions that were fielded by Matt Hiller of CSX Intermodal. 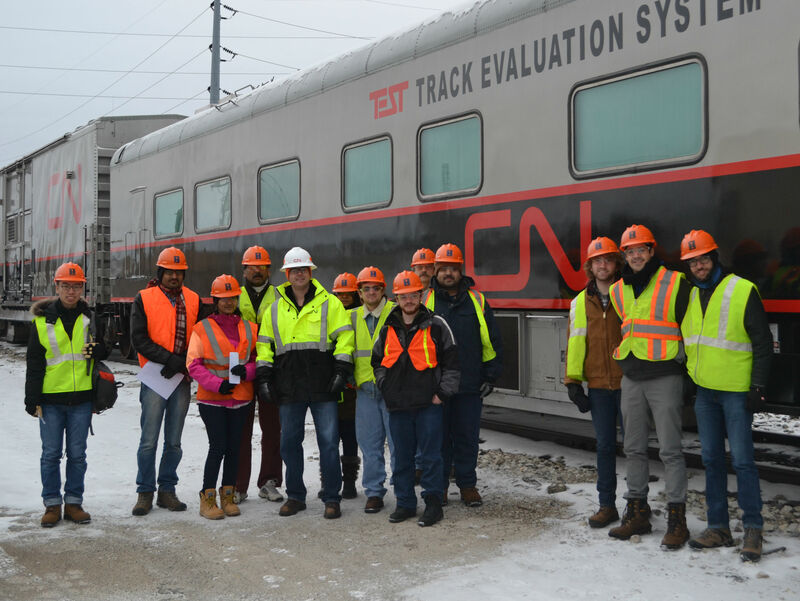 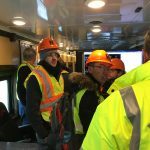 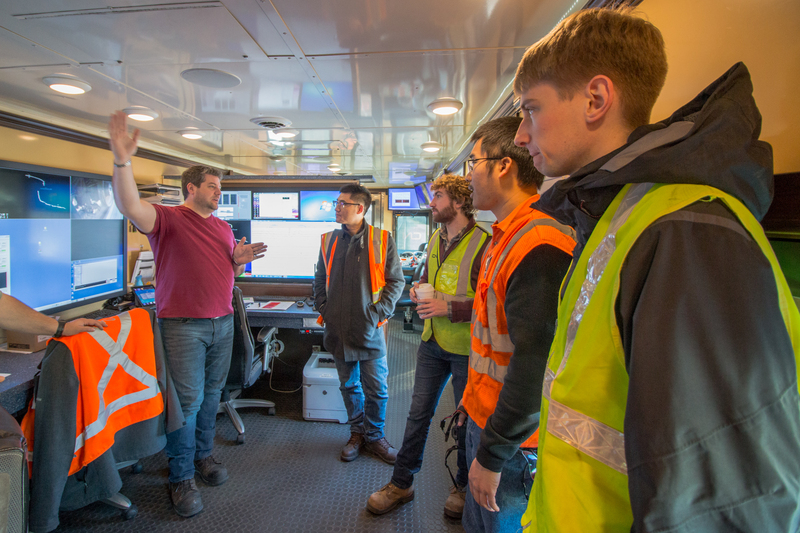 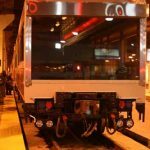 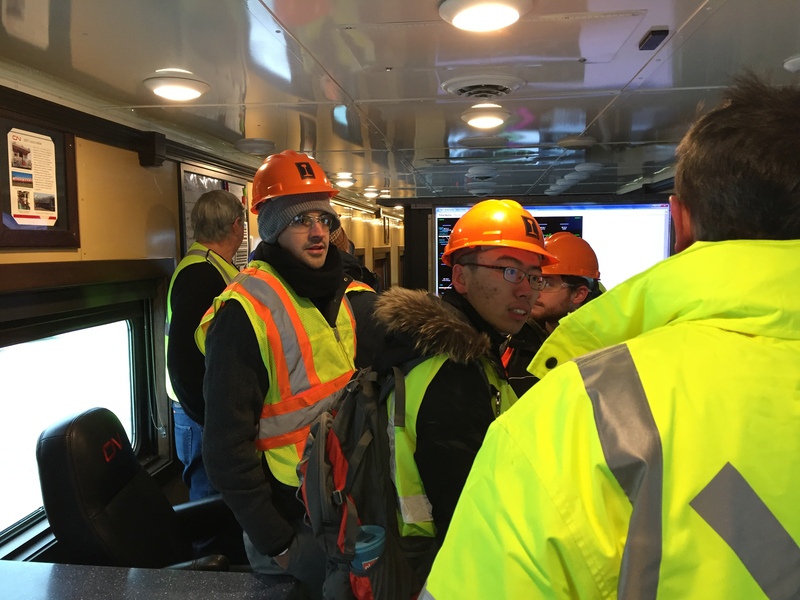 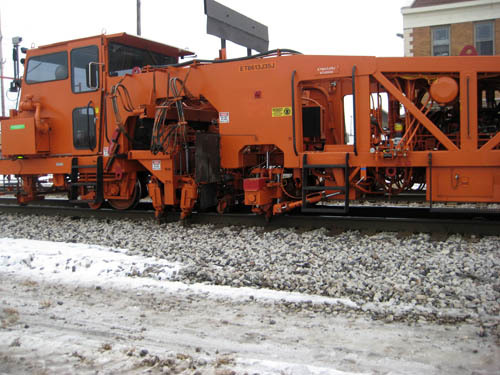 On Sunday, February 14th, a dozen RailTEC faculty and students toured the new CN Railway Track Evaluation System Train (TEST) while it was in Champaign, IL. 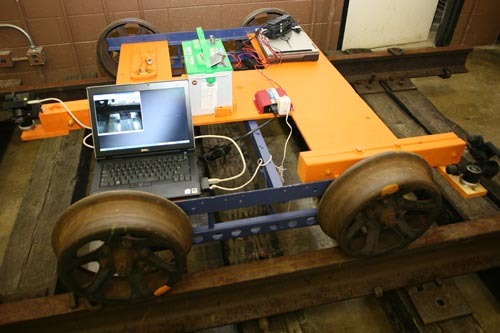 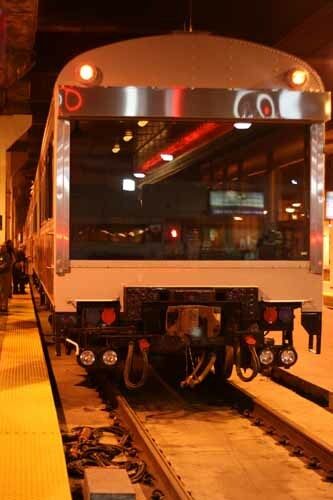 The new test train measures track geometry and gage restraint while capturing video images of the track structure. 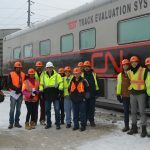 RailTEC alum Kevin Day, CN Assistant Chief Engineer, Technology, Testing and Standards was instrumental in development of the new TEST train. 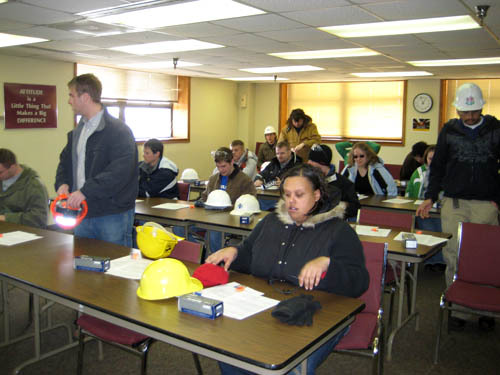 In addition to looking at all the equipment, the students were glad to be out of the cold. 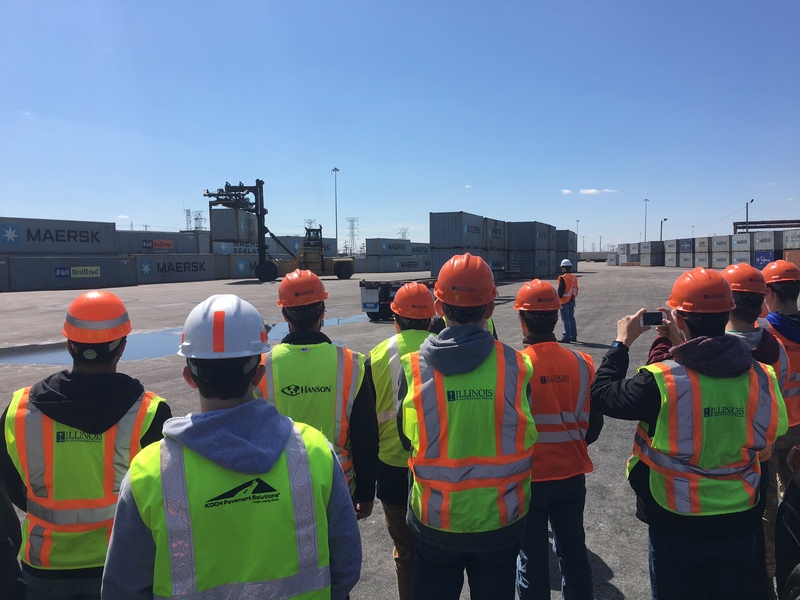 Students listen to a presentation before touring the CSX’s Bedford Park Intermodal Facility. 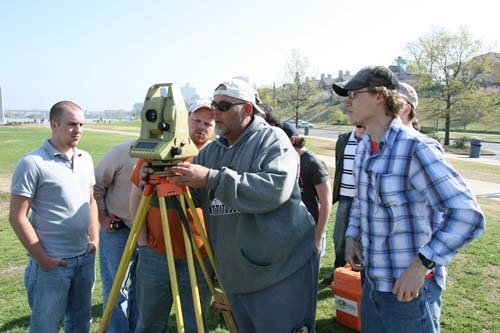 The students help demonstrate the size of the equipment. 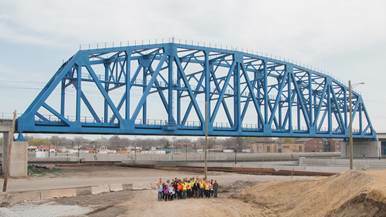 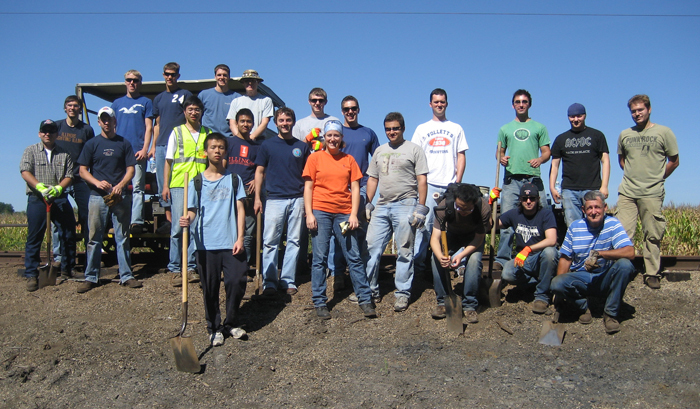 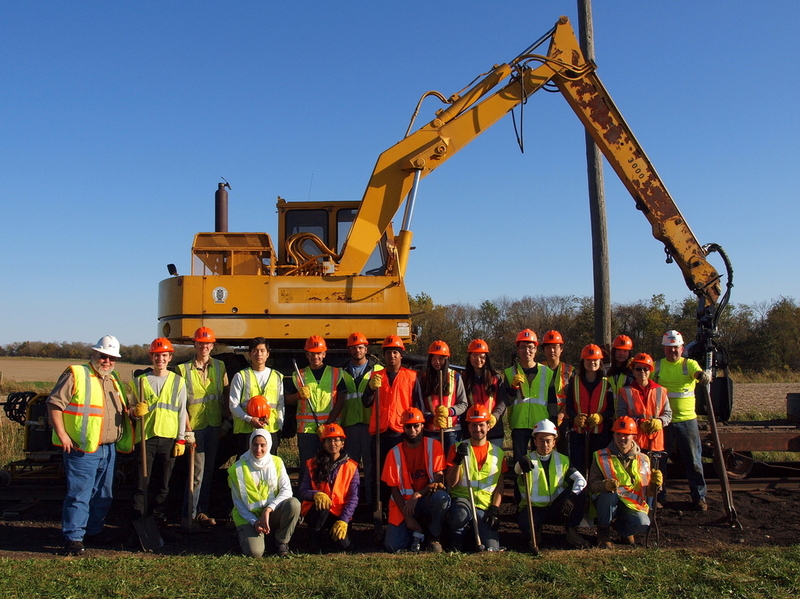 Students from CEE 411 pose at the CREATE GS15a capital project at 130th and Torrence Ave. 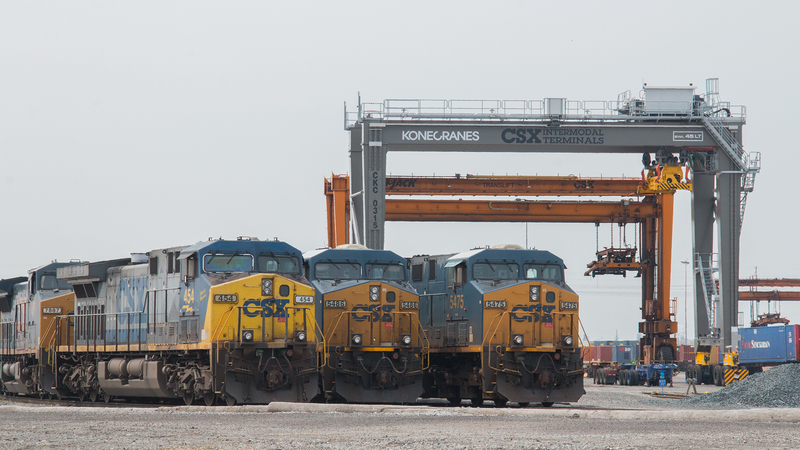 The CSX intermodal facility is located in Chicago and is among the largest in the United States. 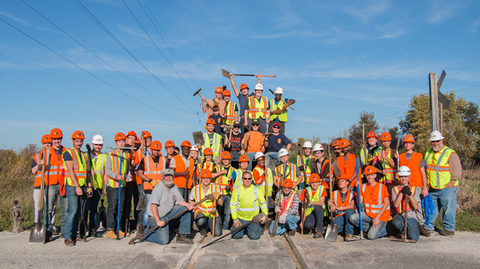 Group photo from October 25, 2014. 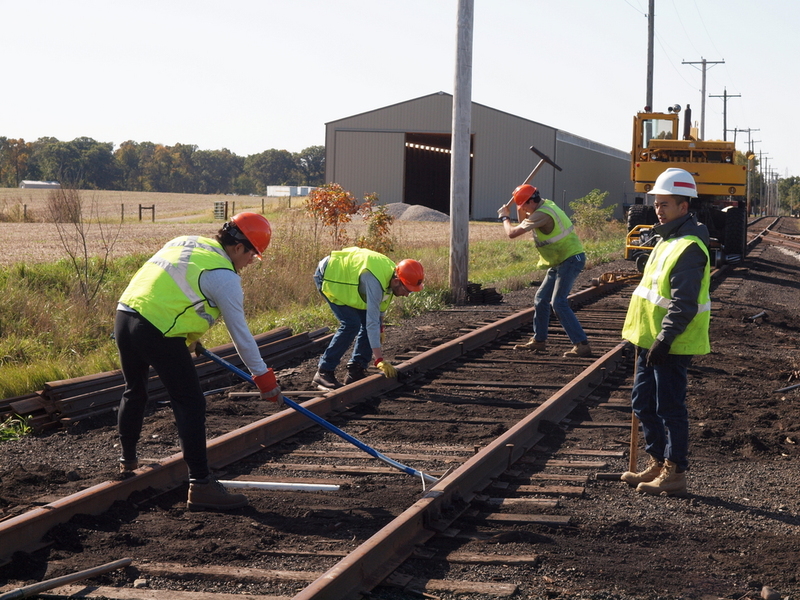 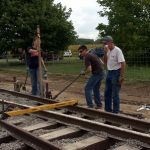 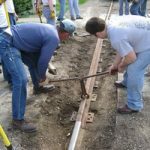 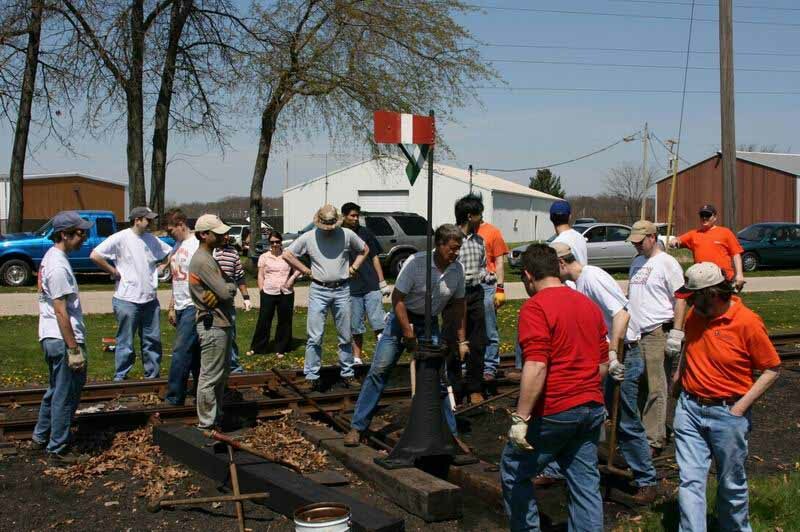 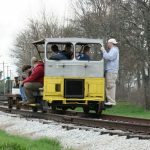 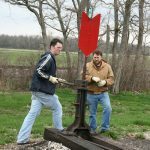 Nearly 70 civil engineering students and faculty from the CEE 408 and 409 classes participated in two “work days” at the Monticello Railway Museum (MRM) in Monticello, Illinois. 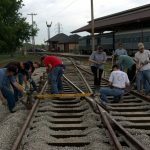 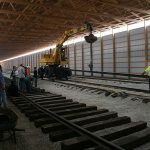 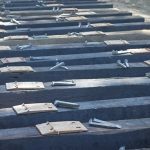 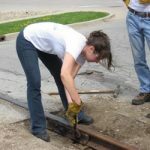 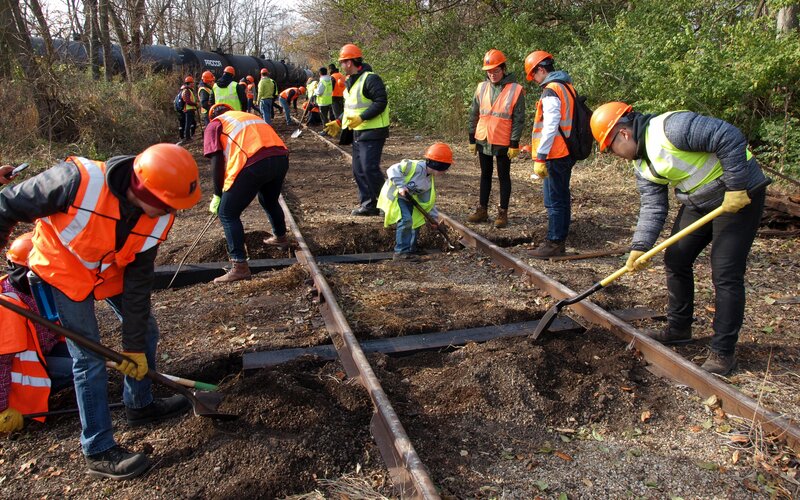 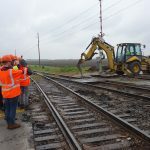 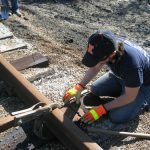 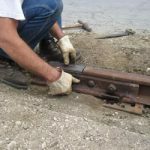 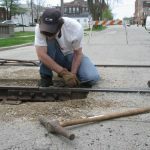 The projects consisted of assisting MRM volunteers installing ties, gaging, surfacing and aligning track, placing ballast and repairing washouts which included the installation of drainage pipes under the track. 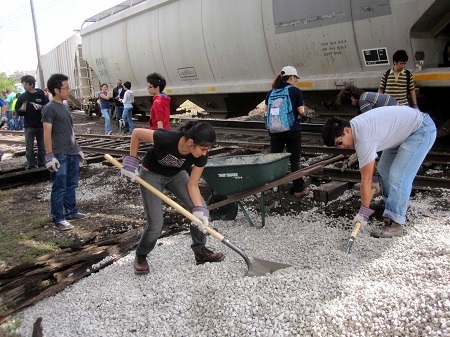 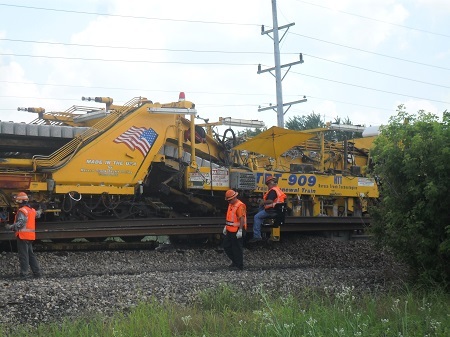 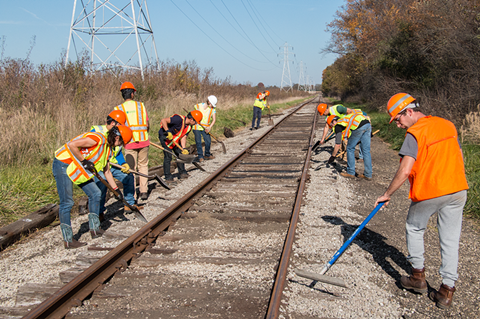 More than 100 ties were installed and approximately 1,000 feet of track were restored to Class 1 conditions. 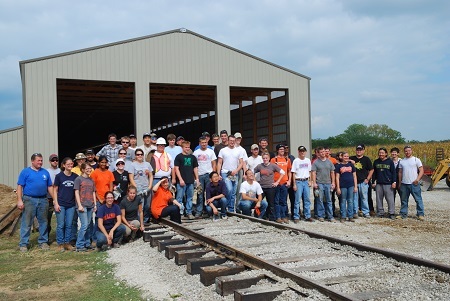 A safe, productive and enjoyable time was had by all. 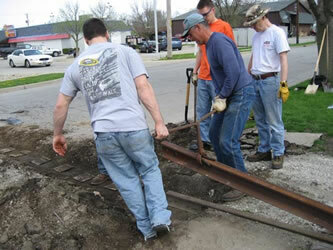 Thanks again to MRM for the opportunity to provide “hands on” track work experience for RailTEC students. 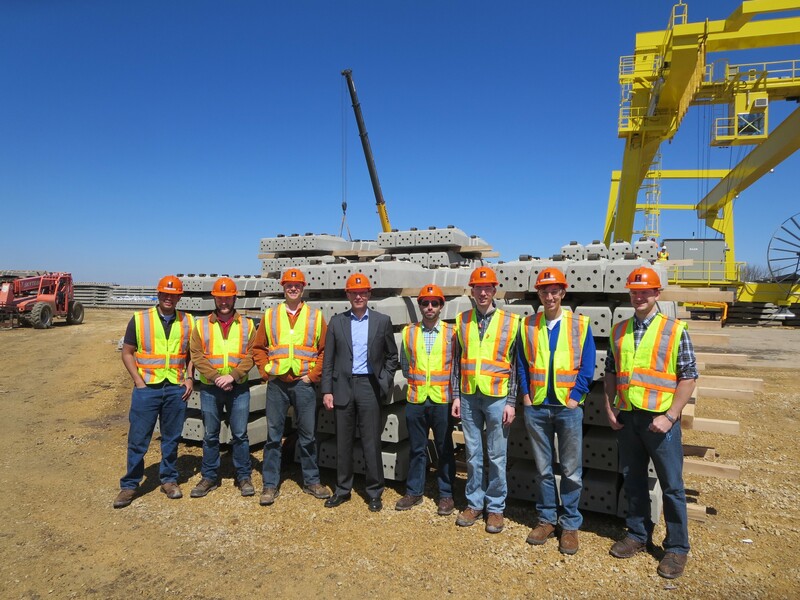 The RailTEC Crosstie and Fastening System Research Team visited the new RAIL.ONE facility in Clinton, IA on April 25, 2014. 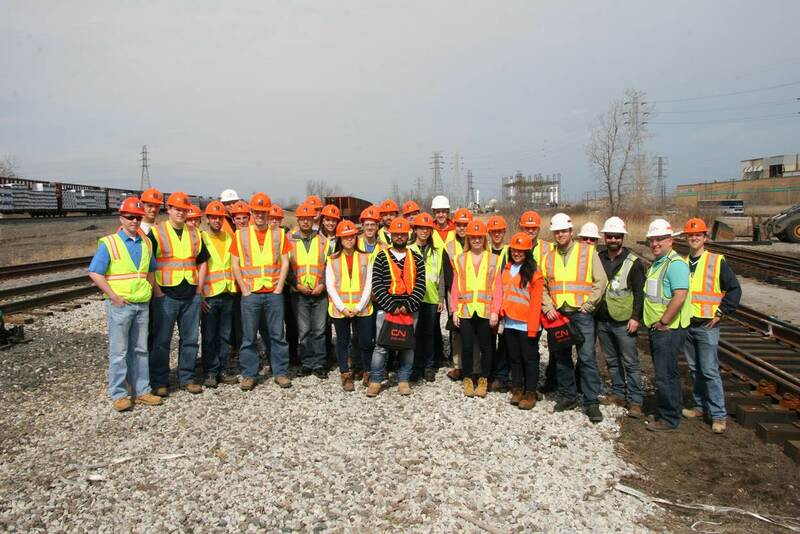 Students in CEE411 toured CN’s new facilities at Kirk Yard in Gary, Indiana on Saturday 12 April 2014. 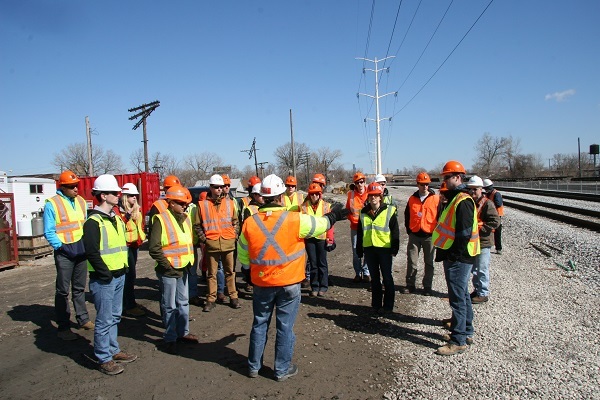 This trip was a good overview of classification yards, railroad operations, capital expansion projects, and, on a higher level, railroad culture (specifically safety). 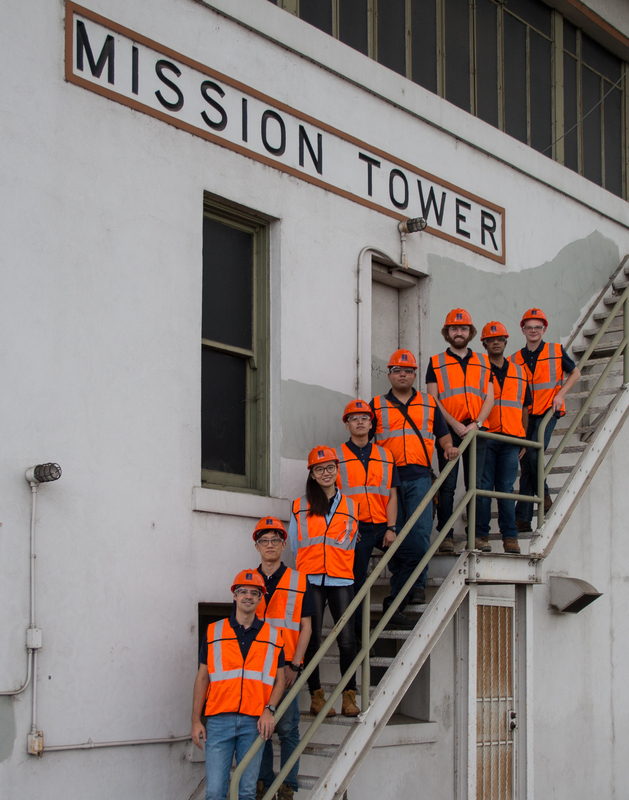 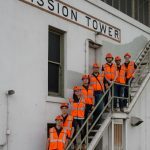 CEE411 students touring CN’s new yard control tower at Kirk Yard. 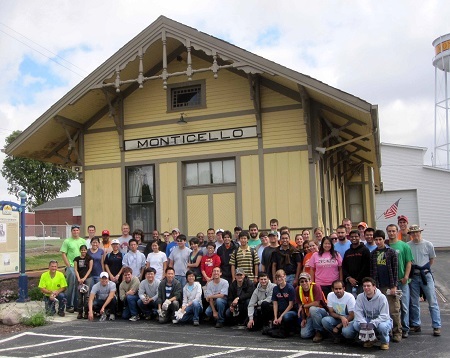 Faculty and students from RailTEC classes on a working field trip to the Monticello Railroad Museum on September 14, 2013. 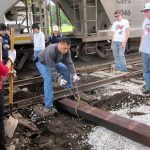 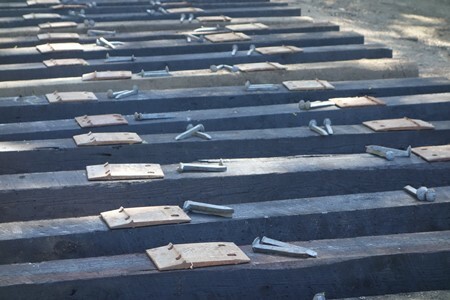 Students installed new railroad ties as well as hardware. 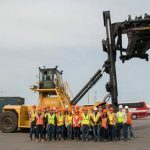 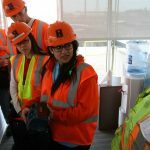 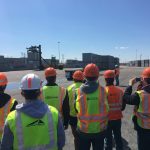 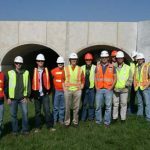 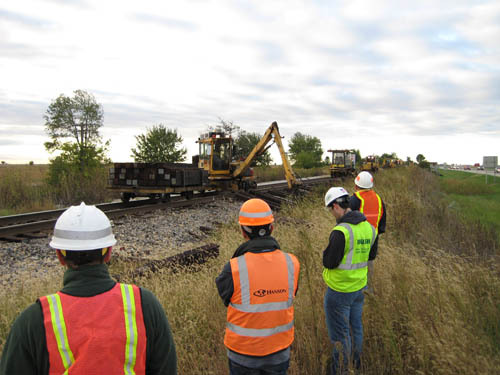 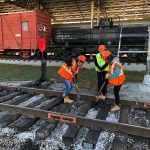 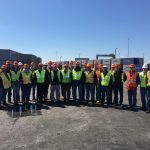 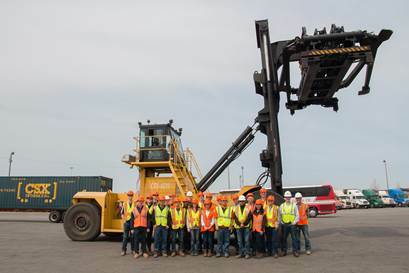 Students from CEE411, Railroad Project Design and Construction, took a field trip to Chicago to visit the Norfolk Southern/Metra Englewood Flyover Project construction site and the CSX Bedford Park Intermodal Terminal. 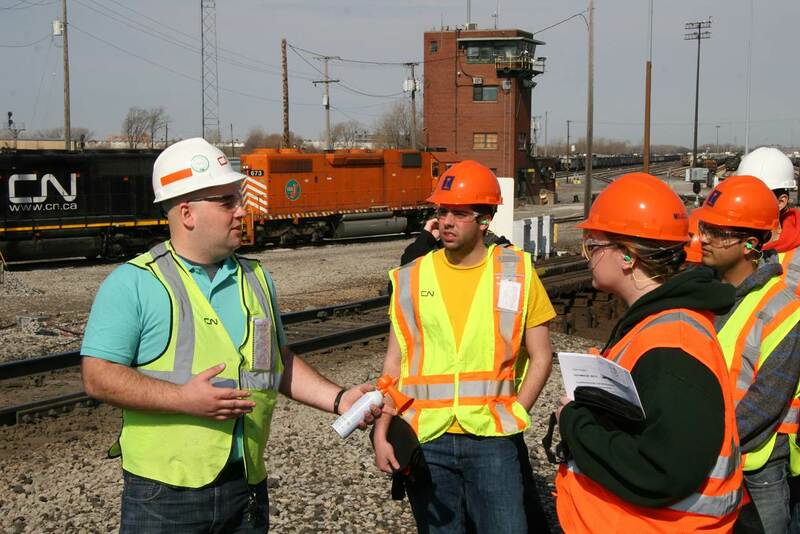 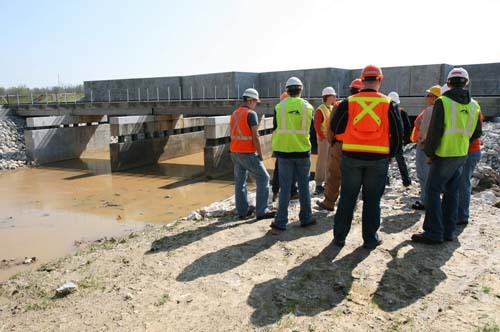 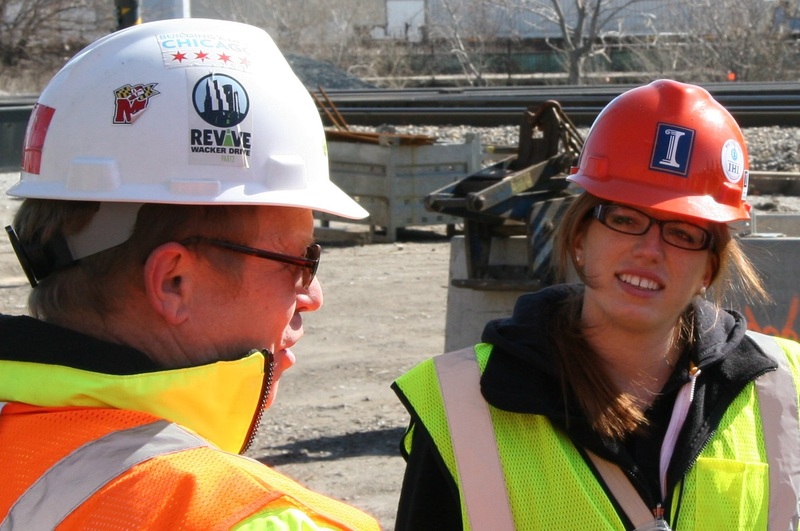 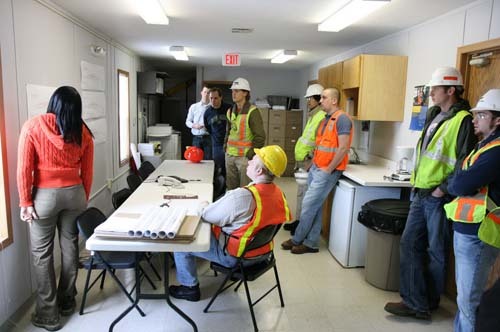 A CEE411 student listens intently to an employee at the Norfolk Southern/Metra Englewood Flyover Project construction site on April 20, 2013. 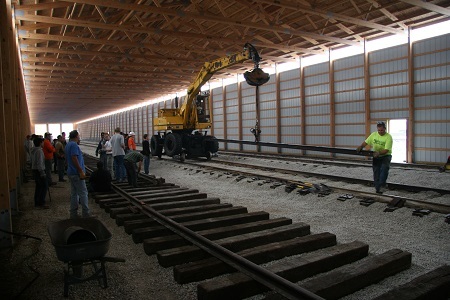 Track work this year was inside one of the storage sheds. 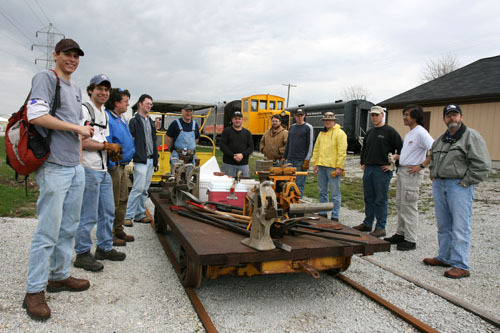 Faculty and students from RailTEC classes on a working field trip to the Monticello Railroad Museum on September 19, 2011. 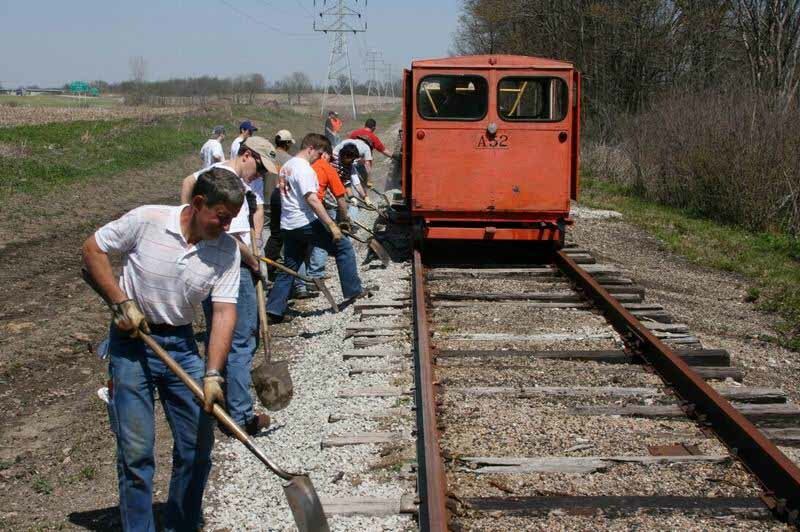 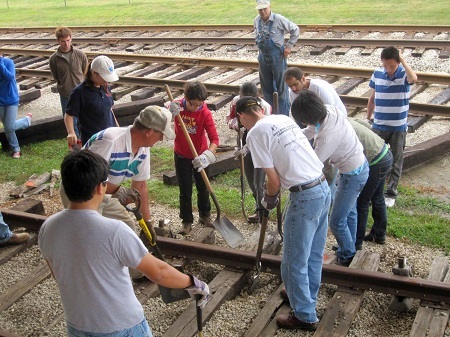 Volunteers working along the section of track to be maintained this year. 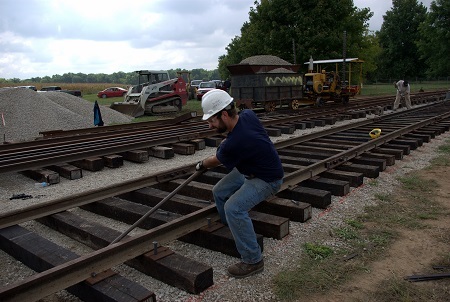 A student working hard to get the track aligned in exactly the right spot. 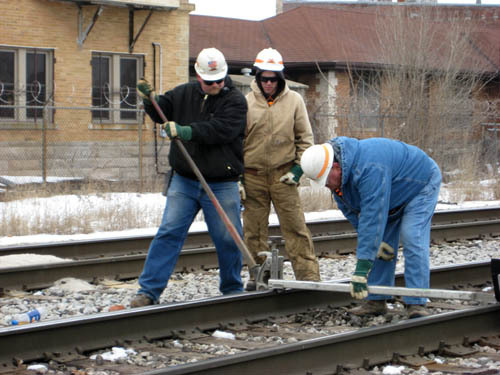 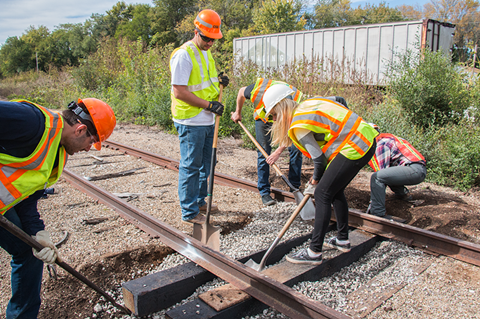 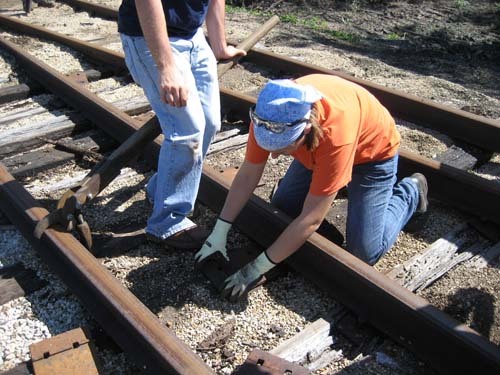 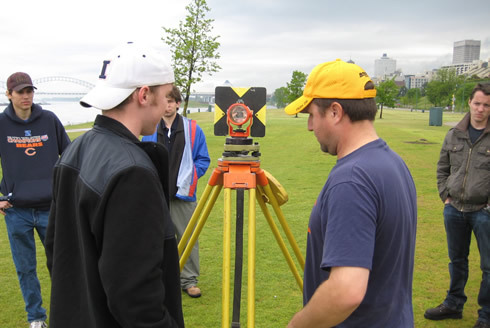 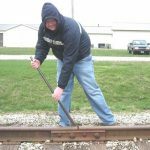 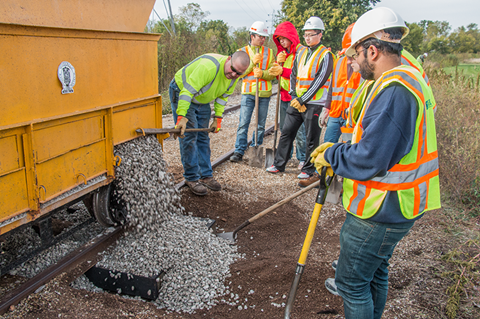 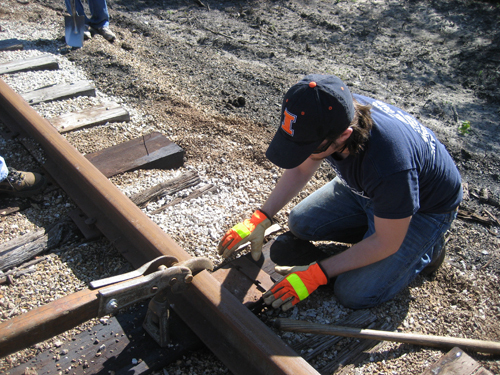 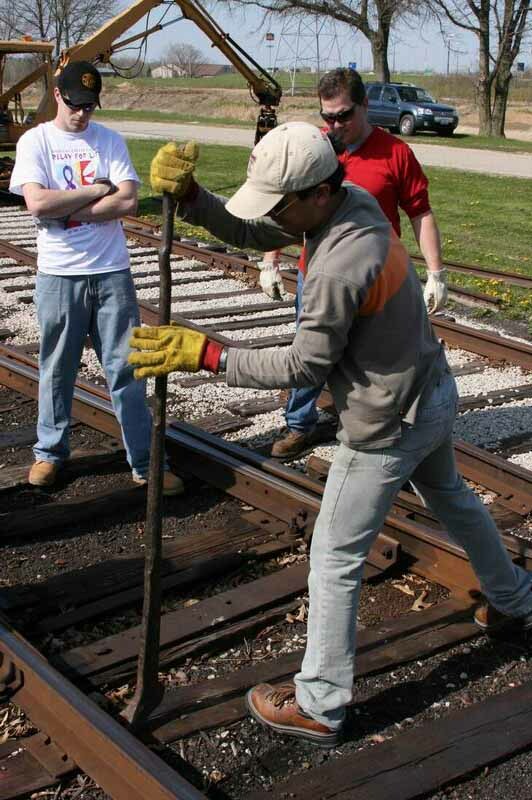 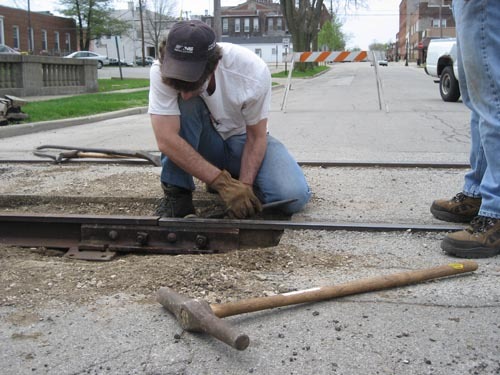 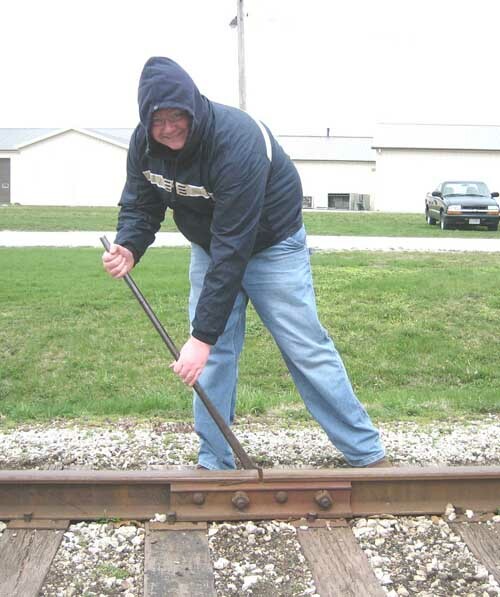 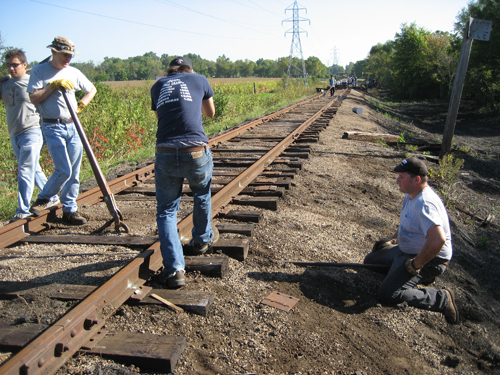 Students use a rail alignment tool and a track liner to get the rail into the right place. 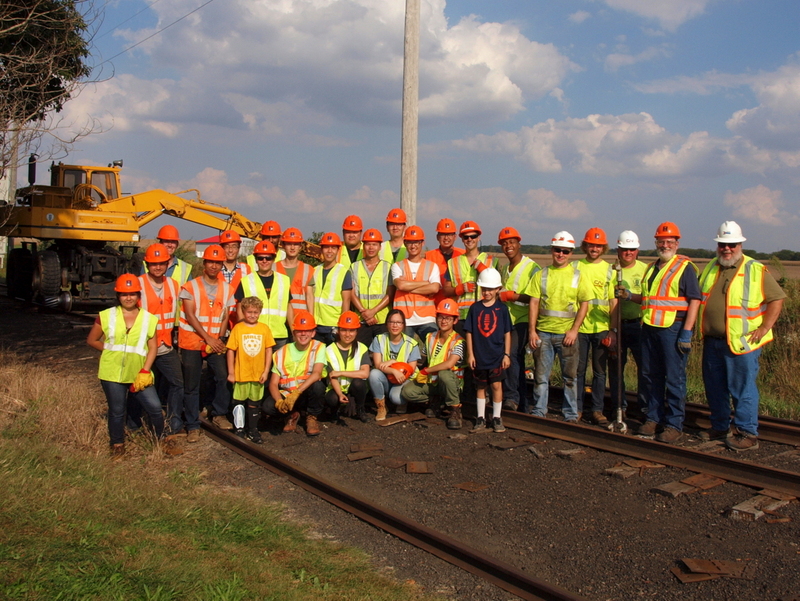 RailTEC faculty and students from CEE408 and CEE409 on a working field trip to the Monticello Railroad Museum on September 11, 2010. 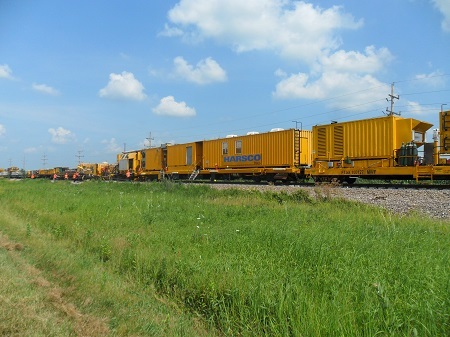 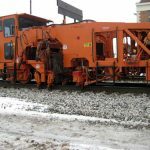 Two student shovel ballast to take to today’s working area. 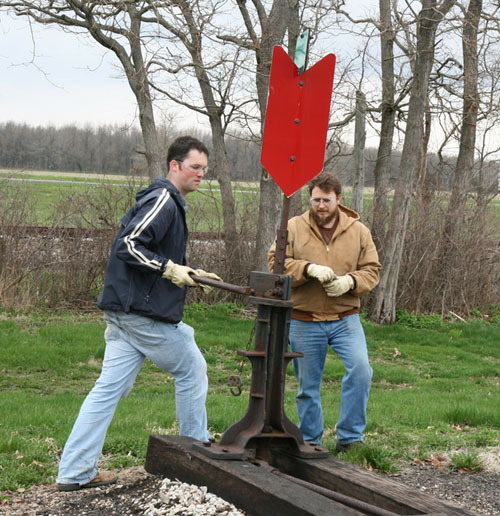 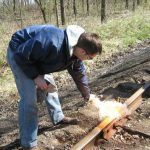 Hauling a new railroad tie into place with a pair of tie tongs. 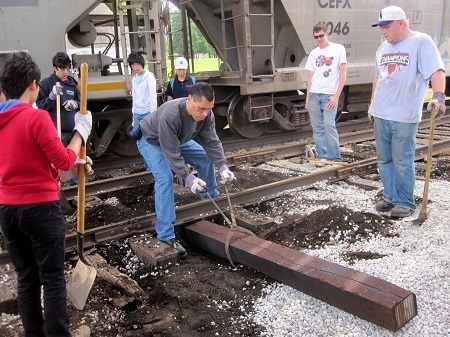 Student tamping around the newly replaced ties. 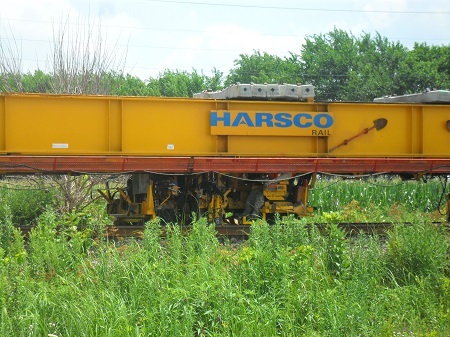 BNSF Track Geometry Car 85, waiting near the Amtrak Station in Galesburg, Illinois. 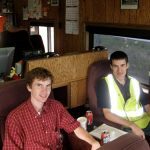 Matt Toussaint, after riding in the cab of BNSF locomotive 4022. 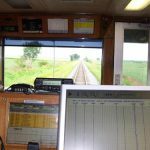 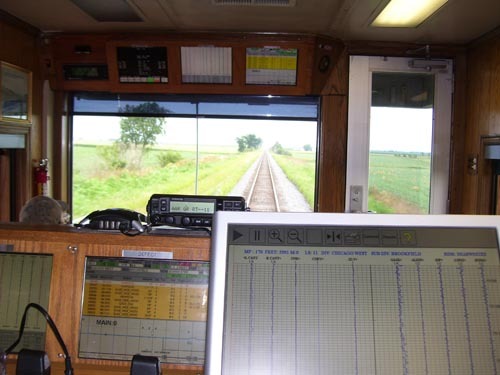 Aboard Geometry Car 85, watching the display panels as we run over track on the BNSF Beardstown Subdivision. 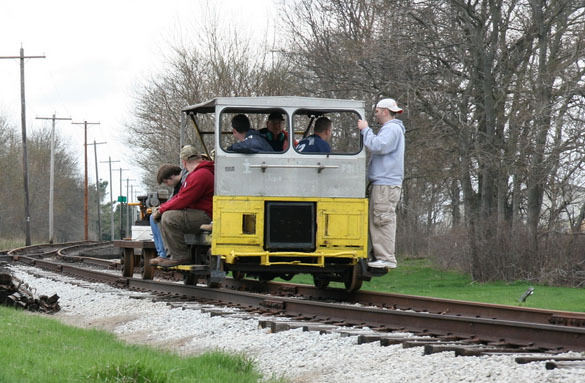 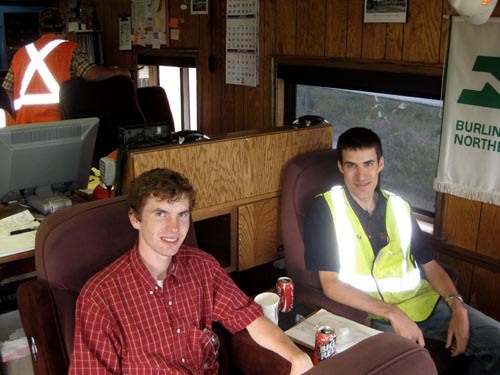 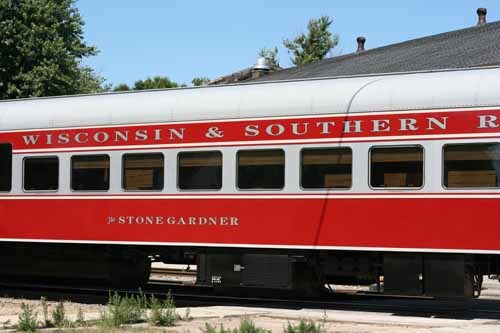 Railroad Engineering Program students Matt Toussaint and John Zeman enjoying the ride on Geometry Car 85. 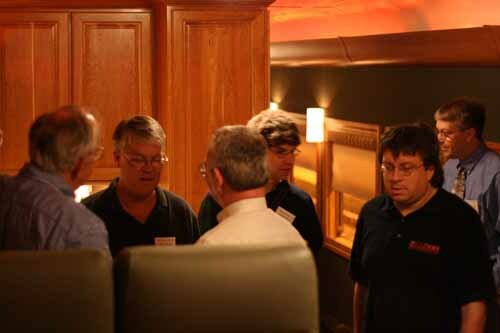 Photographs courtesy of Chris Barkan. 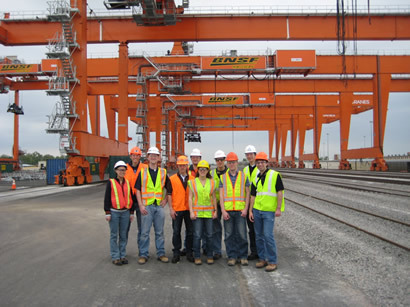 Tour of CN’s Intermodal Gateway Memphis Facility. 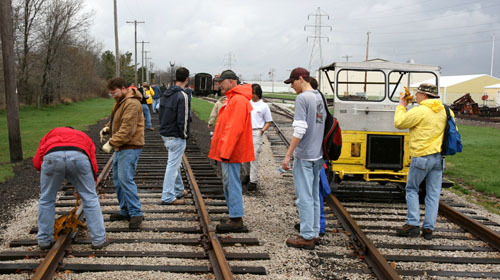 University of Kentucky students and faculty visited the University of Illinois at Urbana-Champaign Railroad Engineering Program March 7-11, 2008. 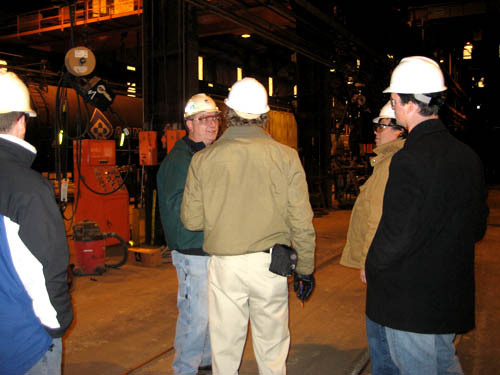 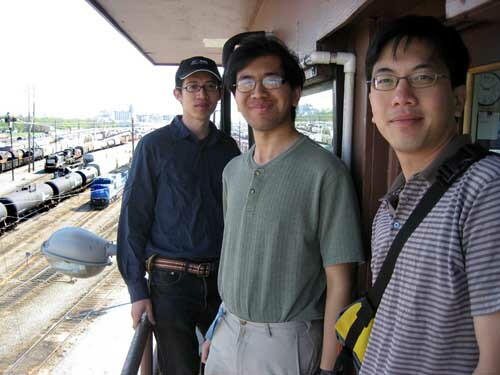 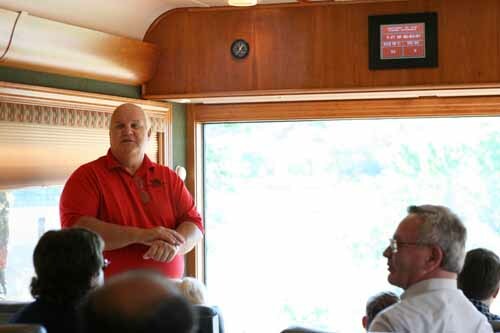 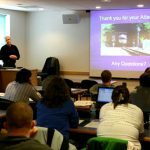 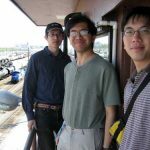 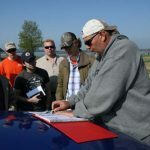 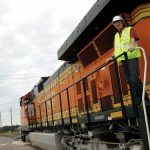 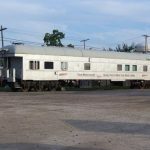 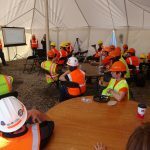 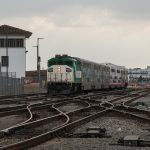 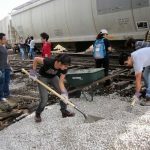 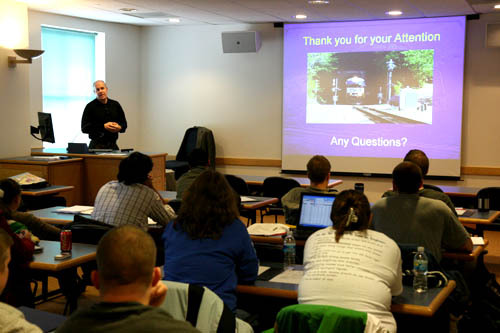 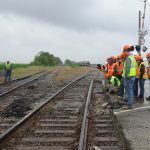 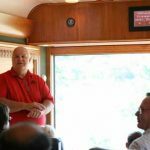 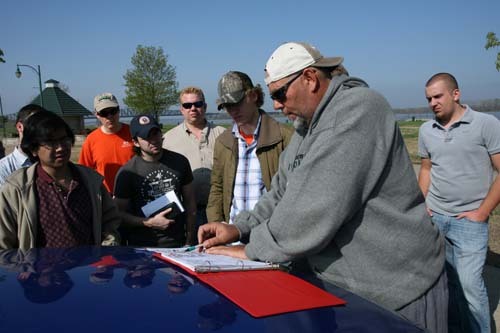 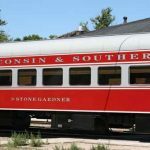 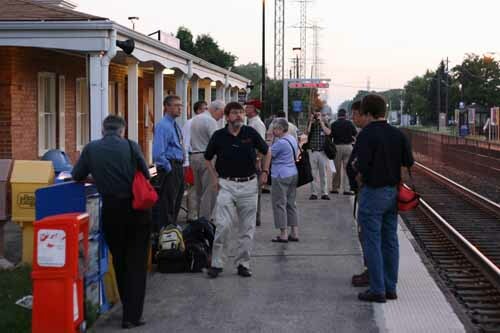 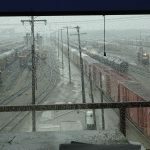 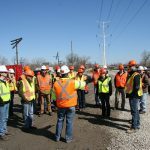 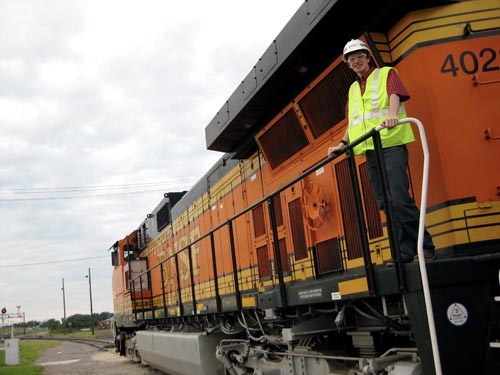 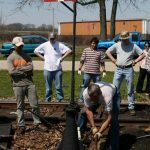 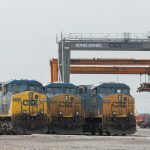 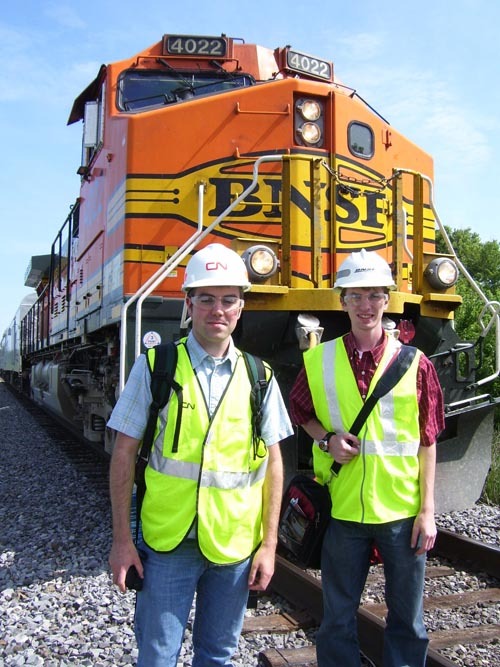 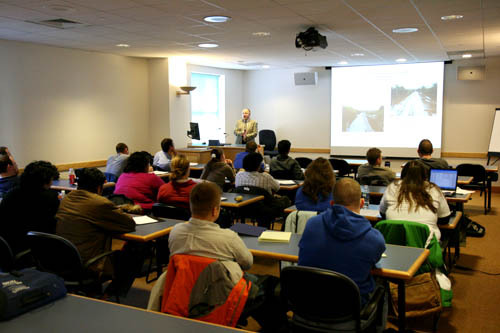 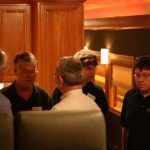 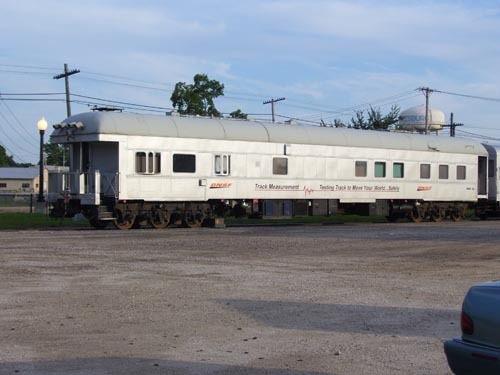 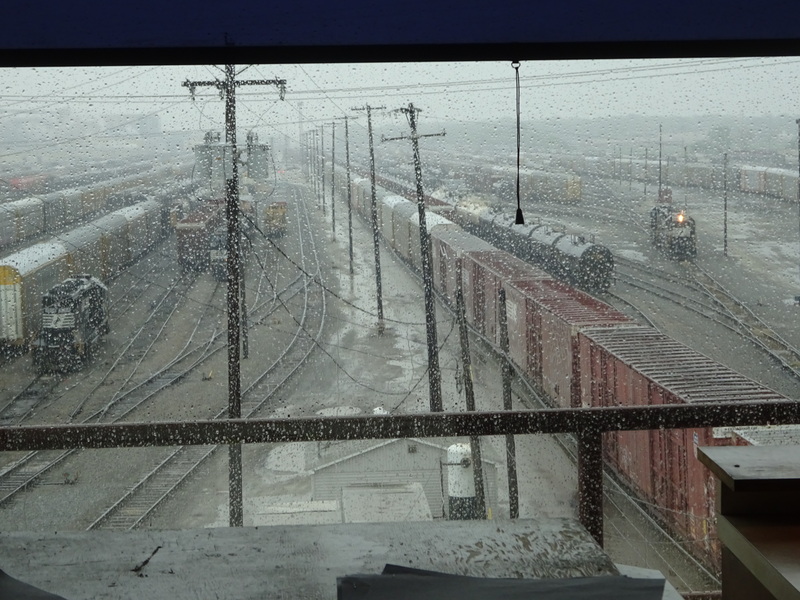 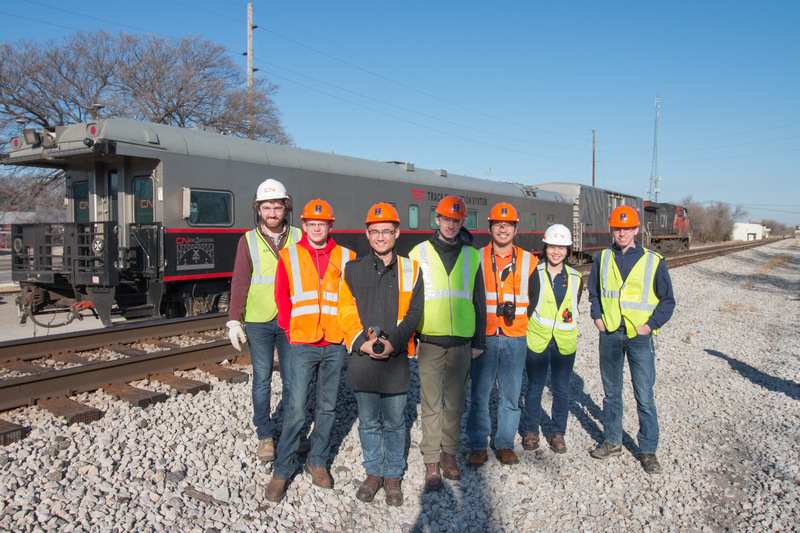 The scheduled events were presentations from professors of the UIUC students on their research, lectures from University of Illinois and University of Kentucky, a tour of Newmark Civil Engineering Laboratory, a presentation from Chuck Gullakson – CSX Transportation, a presentation from David Becker – Norfolk Southern, and a field trip to the Norfolk Southern Railway’s Decatur Yard and Dispatching Center in Decatur, IL. 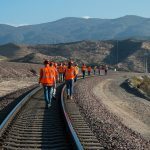 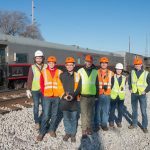 This visit provided an unique opportunity for both University of Kentucky and University of Illinois to collaborate with each other about railroad engineering and to learn more about possible research and career opportunities. 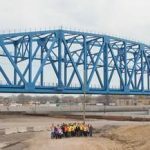 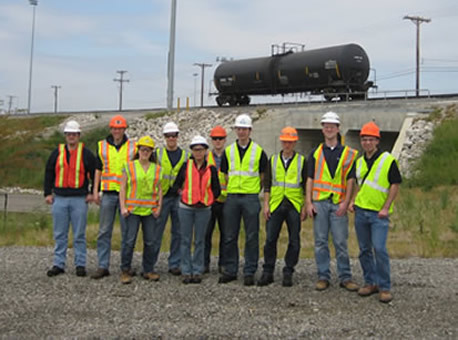 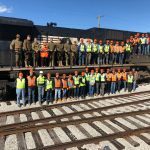 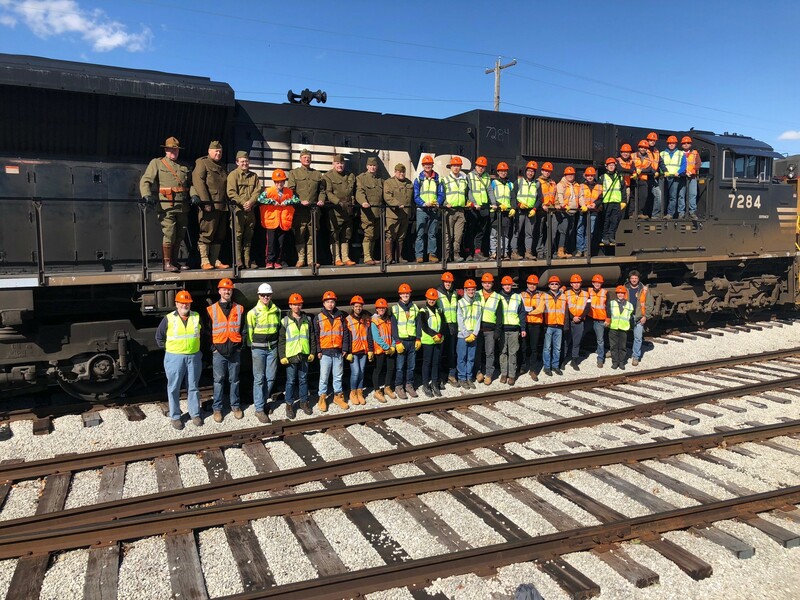 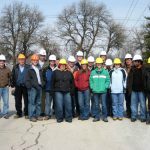 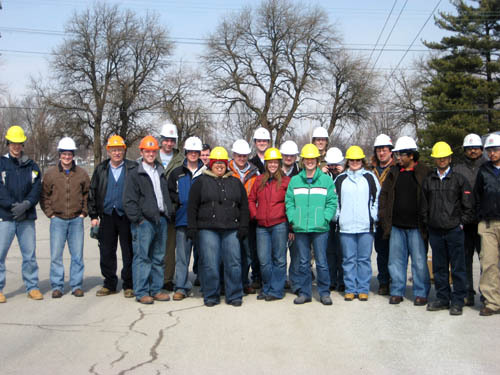 A group picture of the University of Kentucky and University of Illinois at Urbana-Champaign students and faculty before the field trip at the Norfolk Southern Yard in Decatur, IL. 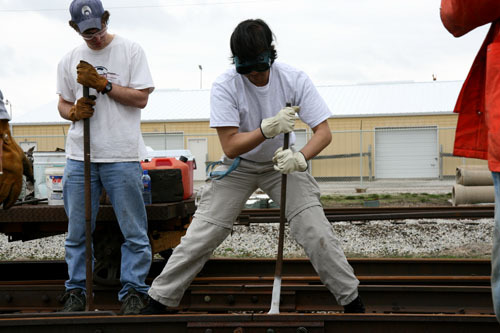 A Norfolk Southern employee explains how railcars are repaired in the car shop. 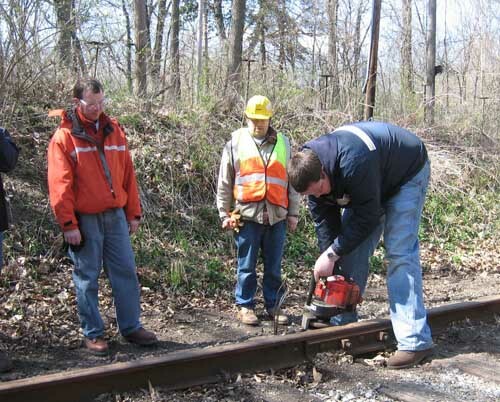 A Norfolk Southern tamper worker in conjunction with other equipment in a surfacing gang demonstration for the students. 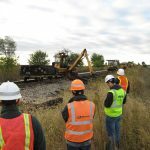 During the classroom portion of the visit, David Becker of Norfolk Southern gave a presentation about the Norfolk Southern Heartland Corridor Project. 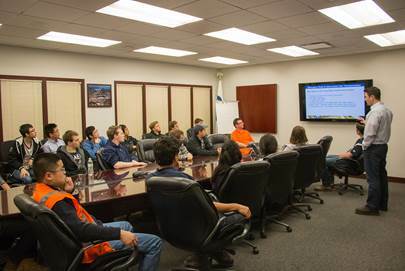 Chuck Gullakson of CSX gave a presentation to the students about the CSX Southeast Corridor Capacity Project. 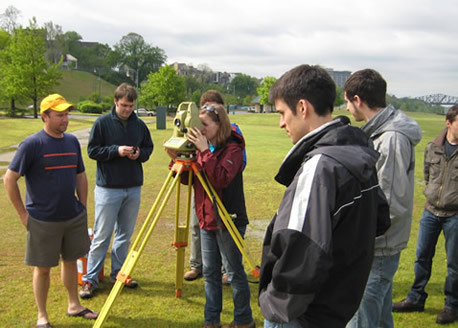 Students observing tie renewal gang. 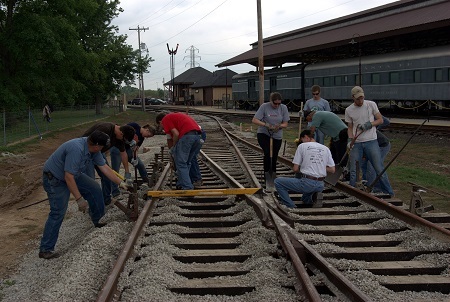 Drew Dalton working on the railroad at the Monticello Railroad Museum. 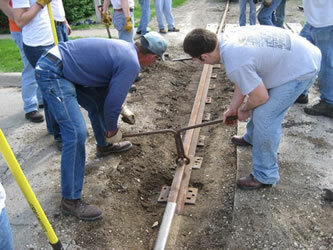 Railroad students installing an Insulated Joint. 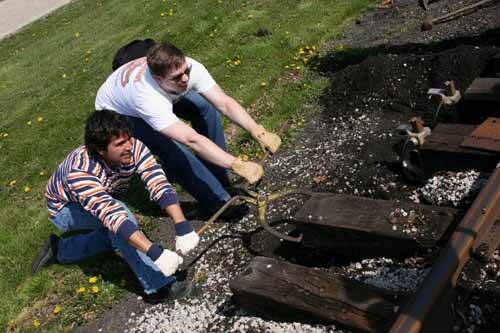 Joe Drapa, Jon Roma, and Drew Dalton. 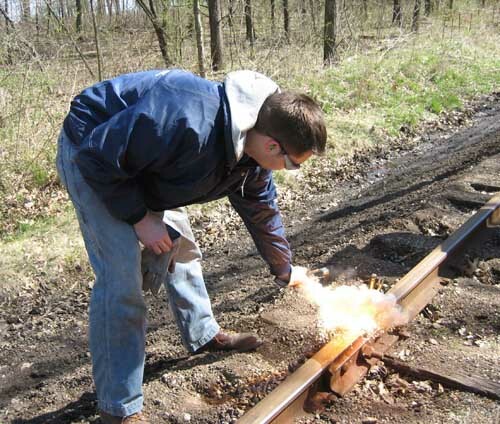 Travis Painter doing a thermite bond.